I apologize for not posting in many months. My focus has been elsewhere and I just haven’t had any adventures in months. I’ve gone to Balboa Park, gone to the beach, walked through neighborhoods, but just didn’t see anything I hadn’t posted about already. So after hearing about Imperial Beach on Monday, I decided to have an adventure yesterday. I drove down I-5 and then took the Palm Drive turn off, exit 5a and made my way to the pier and then down Seacoast Drive to find a place to park. After parking, I walked a short while on the street side of a long row of condo’s and townhomes, until I found a path to the beach. Then I walked on the beach toward the pier. It’s been hotter in San Diego lately, so I enjoyed the cool breeze. The beach was so different than Pacific and Mission beach, which I’m used to walking, as although this beach was lined with places for people to stay, there was hardly anyone on the beach! This time of year, Mission and Pacific Beach, in San Diego, is filled with surfers, sunbathers, kids, adults, umbrellas, shade structures and tents. Plus, those beaches have a boardwalk and many restaurants lining the beach as well. 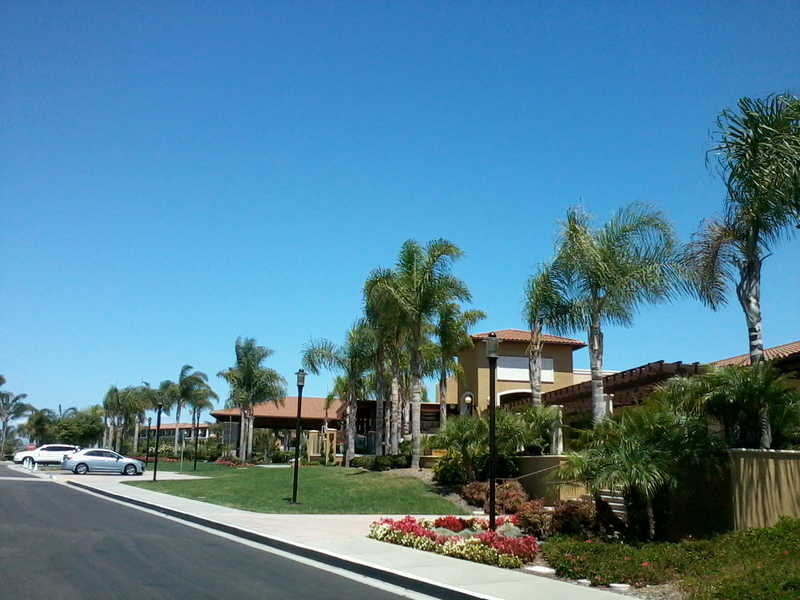 Imperial Beach has the homes, a few hotels, etc. but there is no boardwalk next to the beach, nor any restaurants right on the beach. There a few restaurants on Seacoast Drive. 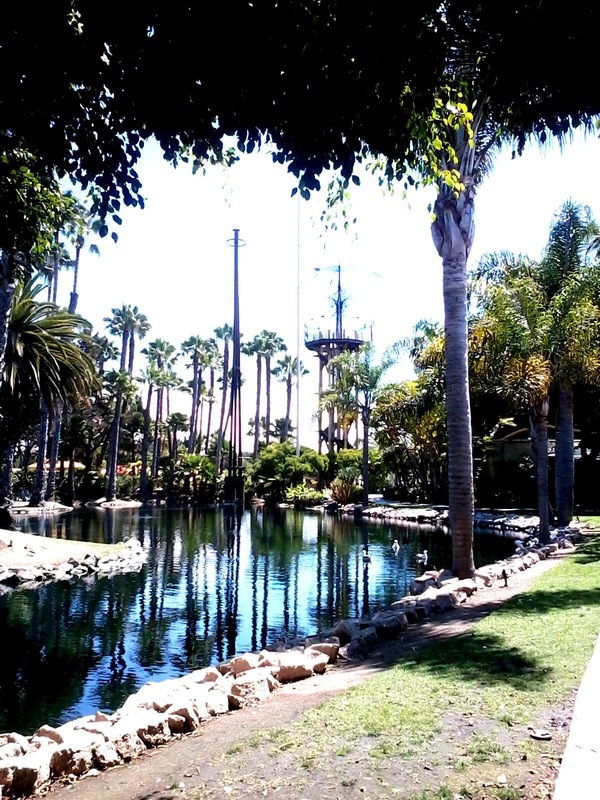 Here is the park that is next to the pier. There is an icecream shop, restrooms and a souvenir shop at this park. There are several benches scattered around the park and they all are made of surfboards. There were also a few painted electric boxes, and here is one that captured my attention. And here is the pier. I didn’t walk out on the pier so can’t tell you what is on it. 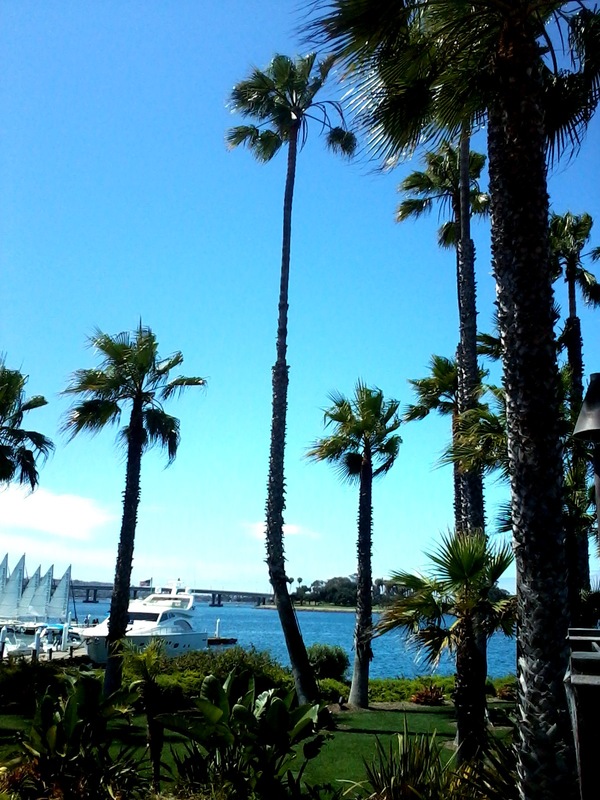 After walking to the pier, I walked along Seacoast Drive, looking for a place to get a quick lunch. I finally found an open Taco shop and had 2 great fish tacos. (Sorry no picture…I just don’t stop to think of food pictures ). I met a great friendly couple who had grown up in Imperial Beach. I asked them what they loved about it. The woman, Linda, mentioned the Tijuana Slough National Wildlife Refuge south of town, right next to the beach, the Tijuana River National Estuarrine Research Reserve, same area, and the Border Field State Park, which is just south of the Reserve and Refuge. She mentioned that along the friendship fence in the Border Field Park, families will gather on both sides so they can hug each other. Oh….how I long for a world without borders keeping families apart, and nations at war. North of town is the San Diego Bay National Wildlife Refuge. All of these areas have walking/hiking/biking trails through them. 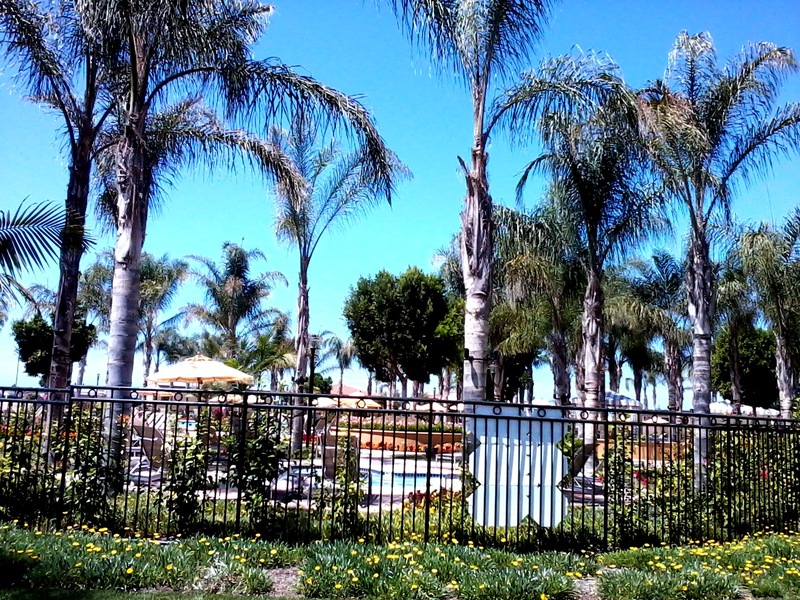 Linda said she enjoyed that Imperial Beach is a small town, with friendly people, quiet at night, plenty of stores, etc. 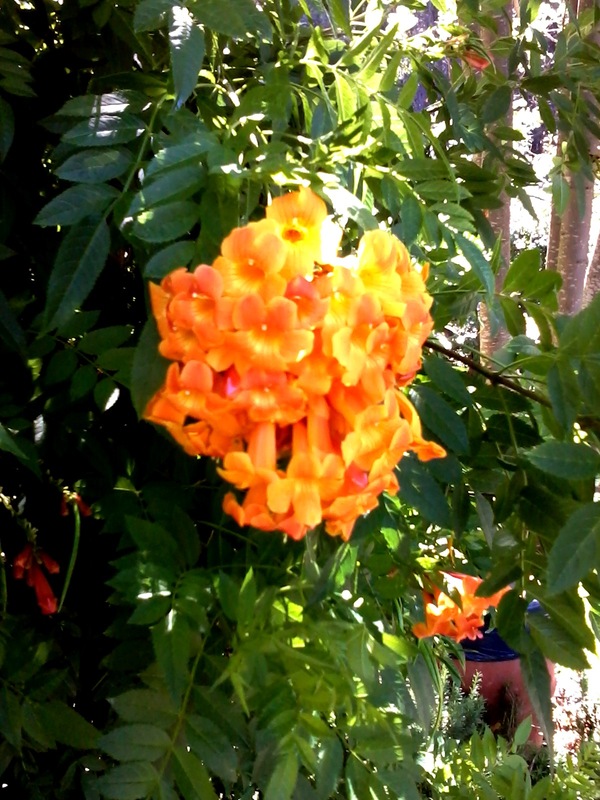 in the city area, yet all this natural beauty to enjoy. 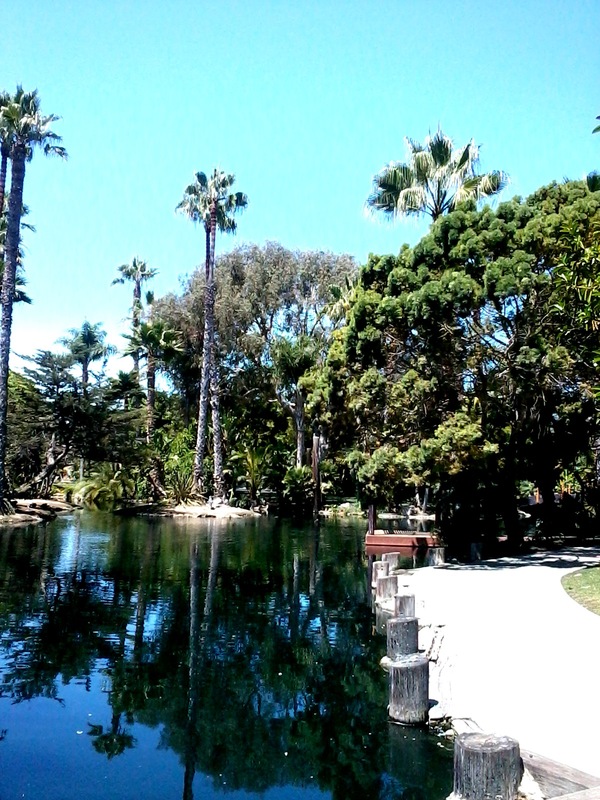 There are other parks along the beach and inland, too. 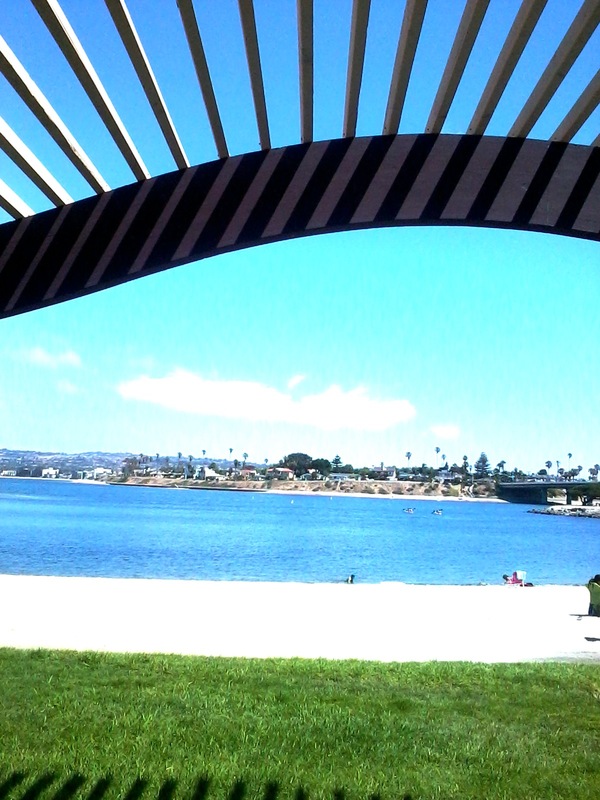 After lunch, I went back and laid on the beach for awhile and read. Note to self….buy some new sunscreen 🙂 I am fried today! I did get visited by this probably hoping for a snack sea gull, who sat about 6 feet from me for quite awhile. After going to the little icecream shop to get a Mexican coffee mocha icecream cone, I took Linda’s advice and did walk down the beach about 40 min. to where the Tijuana River flows into the ocean. The beach was mostly empty but occasionally I’d run across someone, and every few minutes there were Navy helicopters flying overhead. I can spot three of them in this picture. Here are two pictures of the Tijuana River and it flowing into the ocean. If you click on the pictures and enlarge them, you can see Tijuana’s buildings and bull ring on the hillside. On the other side of the river is the Reserve and beyond that, the Border Field State Park. I don’t know if there is a way to cross the river there as the ocean there is deeper with the river running into it. There are roads on the east side of the Park and Reserve and I think that is where people access the trails. After walking back to my car, I decided to take another suggestion Linda made and I took Hwy. 75, the Strand, north, past the San Diego Bay National Wildlife Refuge, past Silver Strand State Beach to Coronado and then took the Coronado bridge back to San Diego. What a fun adventure. I met two other friendly people when I walked down to the river, met that great couple at lunch, got lots of sunshine and hours of walking in, got to explore a new place and had a great road trip. I’m looking forward to going back again to explore the others great nature places in this city. So if you’re local or visiting this way, come check it out! I was lucky to get a spa treatment at Beauty Kliniek, last Thursday. The treatment was a re-gift from my present host, a birthday present for me. I’ve experienced many years of giving and receiving therapies, in spas, resorts, chiropractic offices, and private practice. On one hand, I am discerning after my 37 years of doing the work professionally myself, but on the other hand, I am easy to please and not directive when I am the receiver. 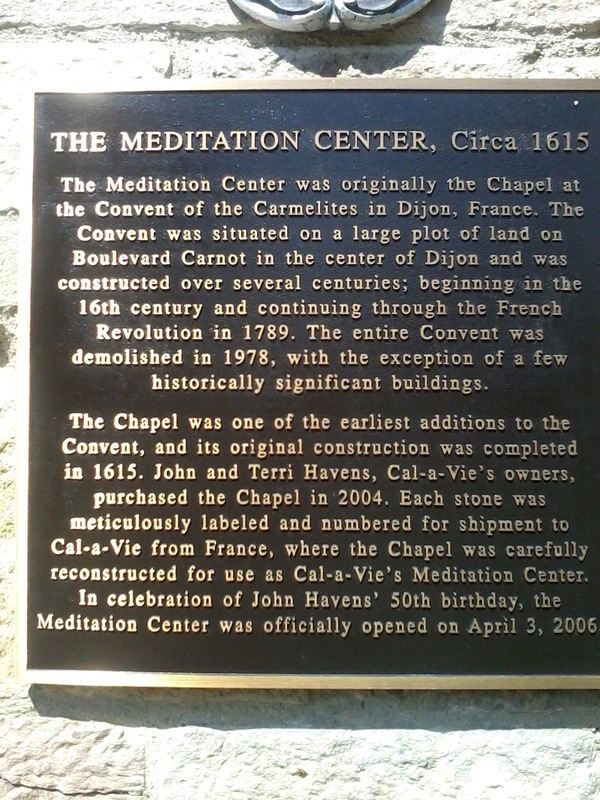 I was very impressed with how extensive the offerings are here, all the services and the space itself. I asked for and received a tour before my session. The spa is 8000 sq. feet with a Beauty/hair salon, a day spa, a wellness center, a eucalyptus stream room, an infared sauna, lockers rooms, a Vichy shower for body treatments, a hydrotherapy tub, whirlpool pedicure thrones, a couples massage room, a spa boutique, a classroom and two relaxation areas. 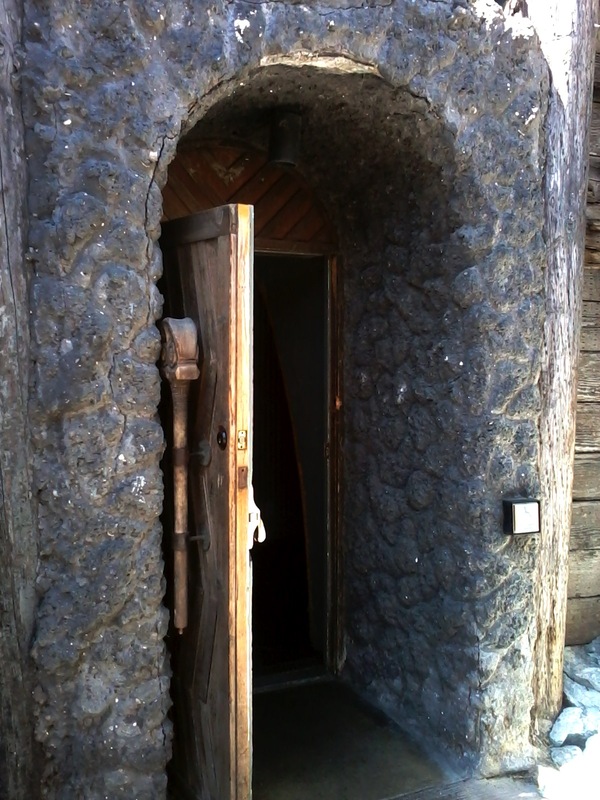 This is the entrance. 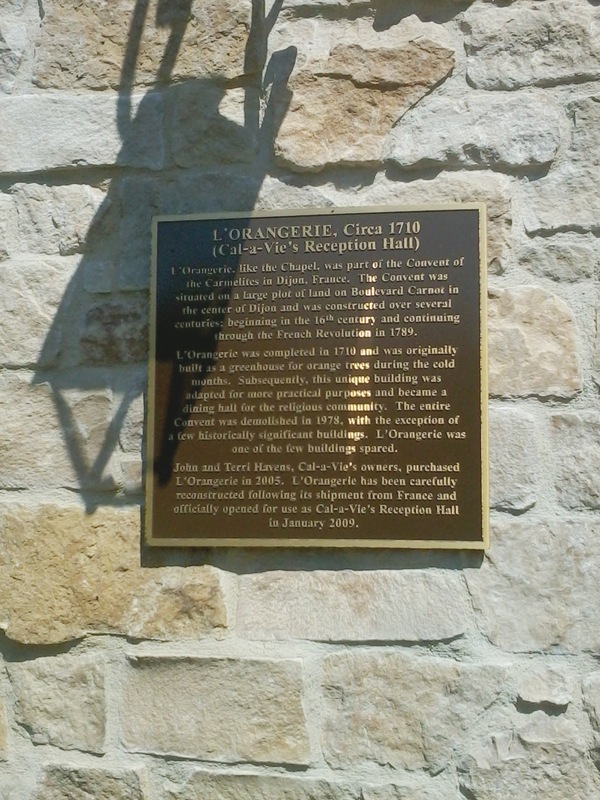 It is in a small shopping area on the NE corner of Regents Road and Governor Drive. 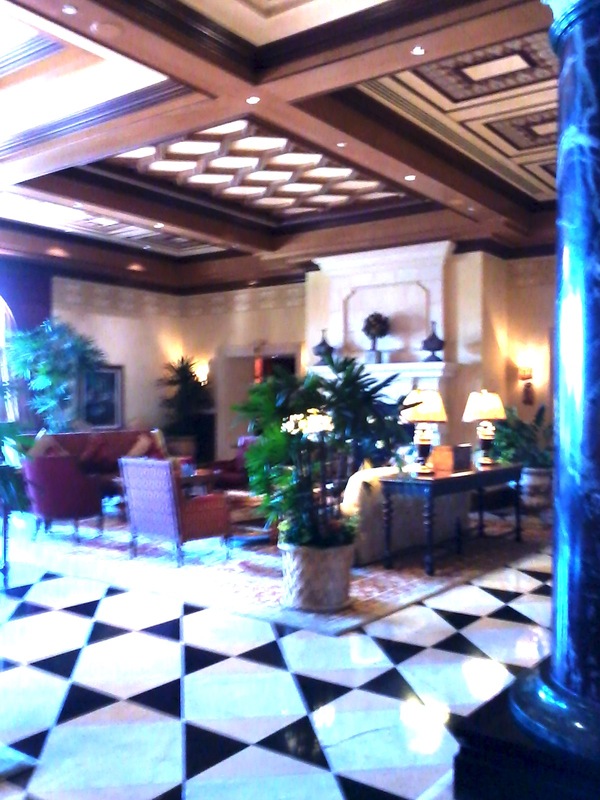 Here is part of the lobby/entrance. This area includes the receptionist desk, chairs and several shelves and counters with make up and other items for sale. 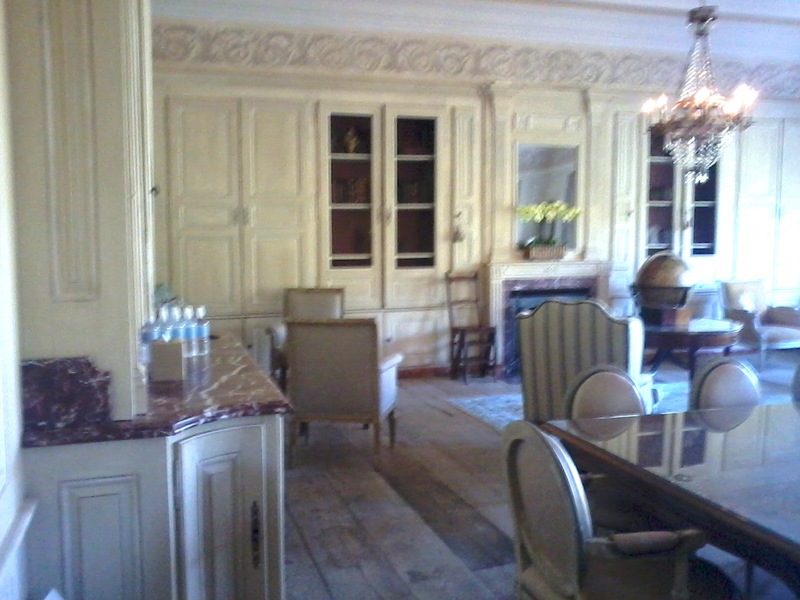 Here is the salon. 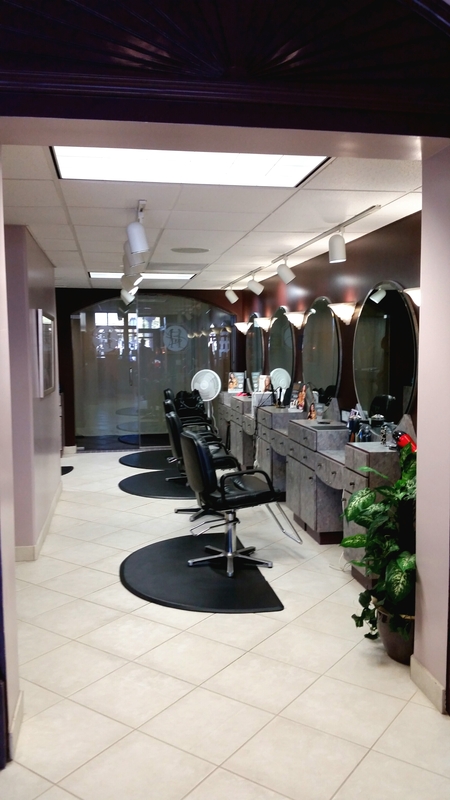 They offer full hair salon services, waxing, nails, make up , all in different areas. They even offer laser hair removal, Photo Genesis and medical laser treatments, Laser genesis, botox, collagen, fillers and other medical beauty/anti-aging treatments. 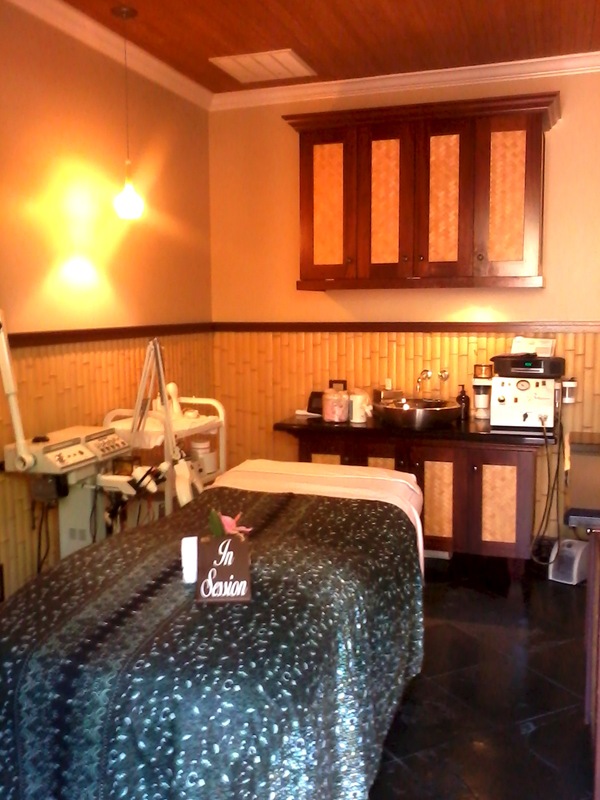 They have treatment rooms where they offer various facials, and micro-current facial sculpting, too. 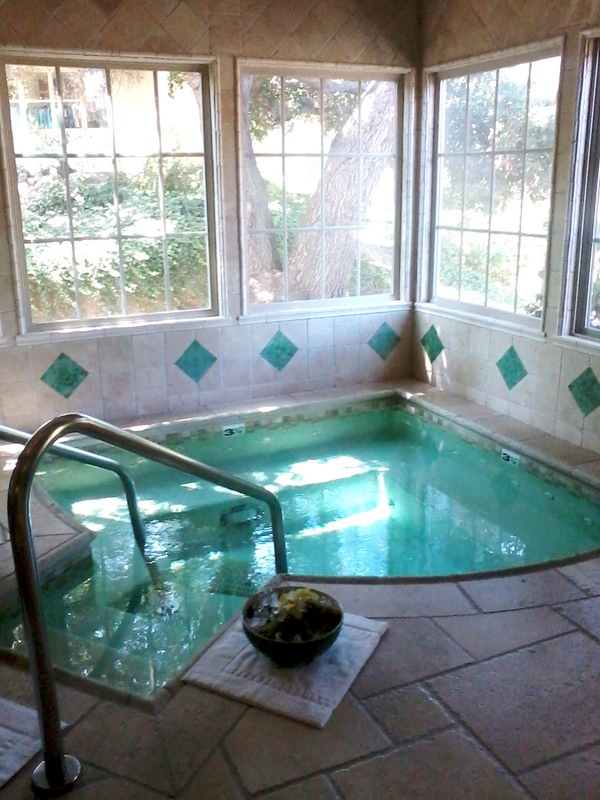 Their body treatment list is extensive with various body wraps, salt glow scrubs, and a hydrotherapy tub. 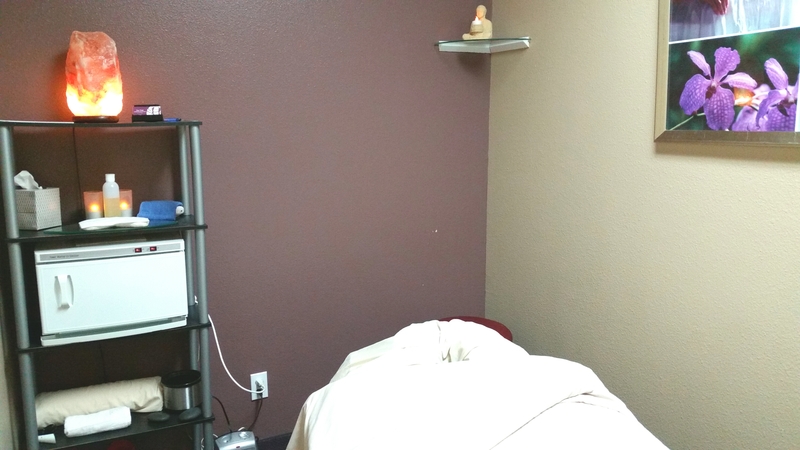 They offer deep tissue massage, hot stone massage, Hawaiian Lomi ke Ah Hoku massage, clinical aromatherapy, pregnancy massage, Thai massage, reflexology and manual lymph drainage. This is the couple’s massage room. 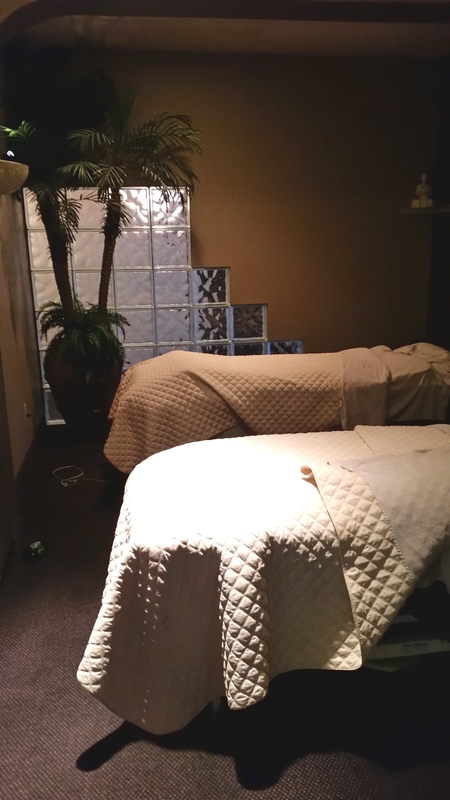 I had signed up for the combo massage, which the spa menu stated included craniosacral, energy balancing, reflexology, tui na, acupressure and several other modalities including Swedish. I am trained in several therapies myself and have received numerous ones over the years, including that list, and only really noticed receiving swedish and deep tissue work in my massage last Thursday. I felt a little disappointed that there wasn’t reflexology and energy balancing, however, I was very pleased with the work I received. 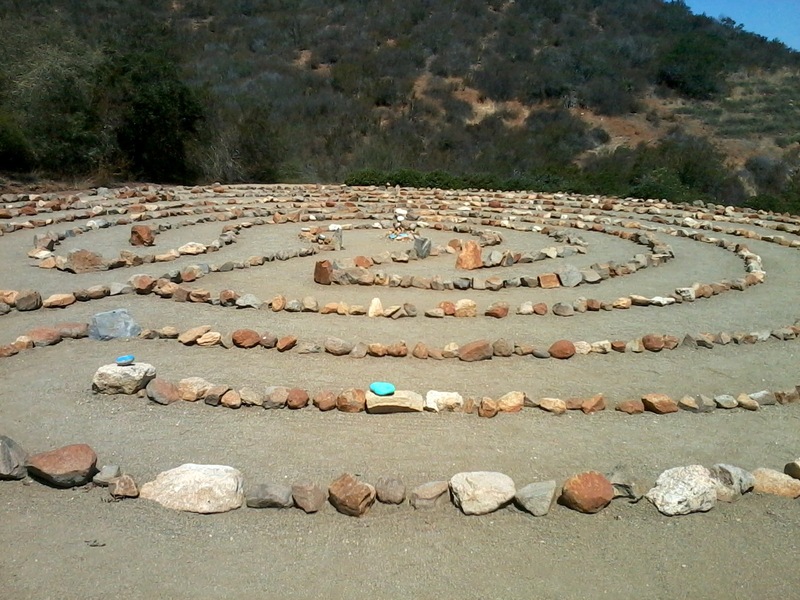 Tasia, was my therapist, and I found her pressure firm, nurturing and confident. The table was VERY comfy and the treatment included nice touches like a warm towel on my back after that area was massaged, a warm towel under my neck when I was face up, a warm pad on my belly, and a warm towel on my feet after the treatment was complete. Along with the above treatments, they have treatments and packages that focus on slimming, detoxing, spa treatments, colon hydrotherapy, packages for Brides, Executive packages, and anything from a few hours long package to all day, including a light lunch. They focus on the whole body and to support that, they also offer yoga and other classes, wellness programs and acupuncture. 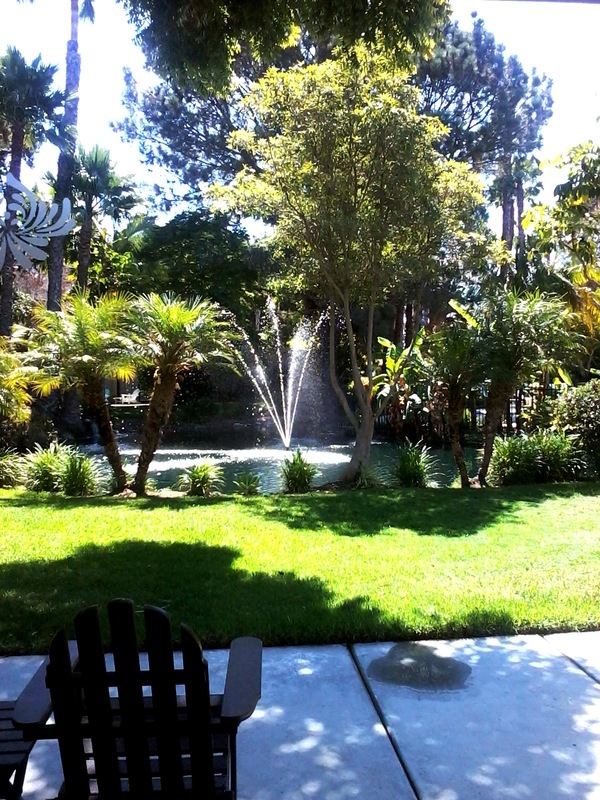 There are two relaxation areas I saw, both set up with water, fruit and hot tea. 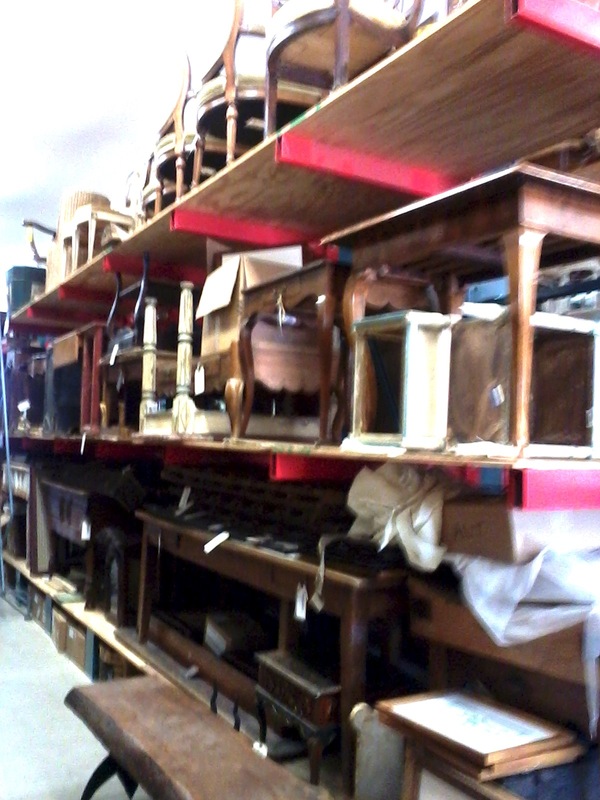 The chairs were very comfy to relax in. 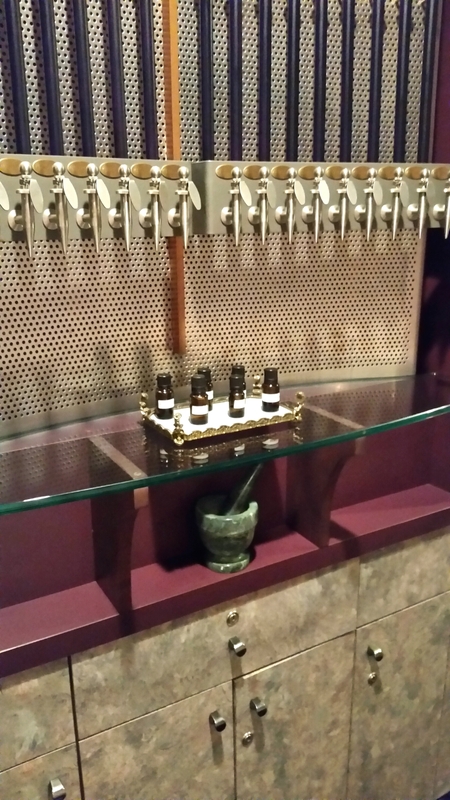 They actually mix their own aromatherapy blends according to the needs of the client. When I checked in, I was led to the women’s locker room where I was given a locker with a key, clean slippers and a comfy robe. There was a changing room, a shower area, bathroom, sink area and they had all the amenities anyone could want to freshen up to return out into the world. 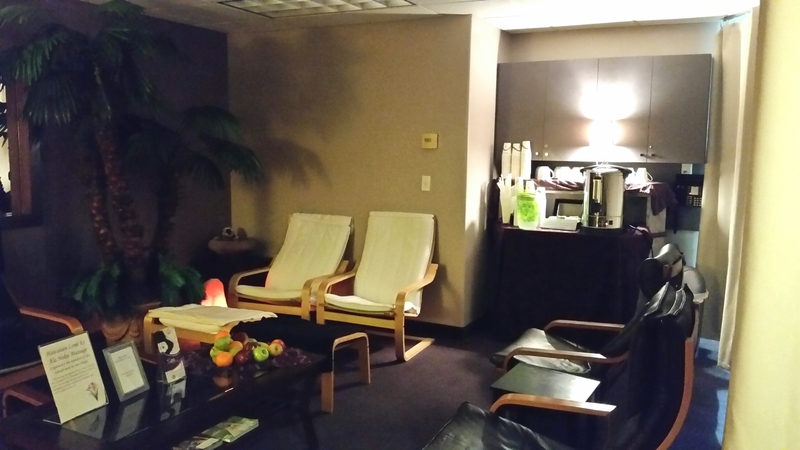 I liked that they offered many supplements, aromatherapy oils, lotions, and other beauty/relaxation support items for sale, to support the benefits achieved at the spa. 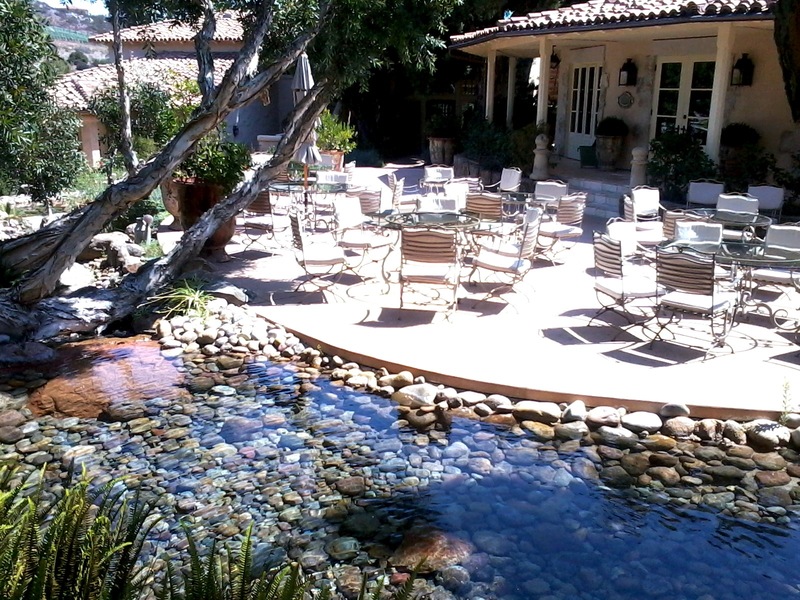 If you are in the San Diego area, come check out this award winning day spa. They are celebrating their 33rd anniversary in Oct.! 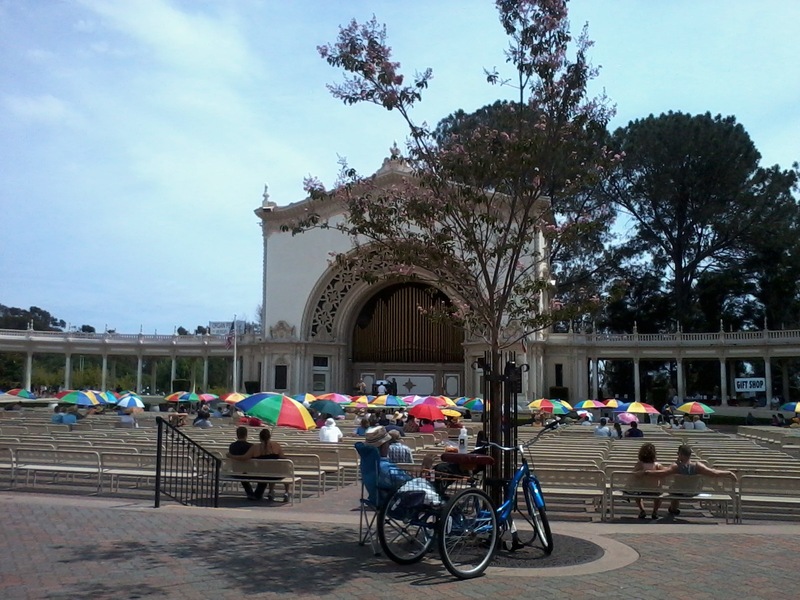 I decided to head over to Balboa Park on Sunday, July 27th, to hear an organ concert. Many of the listeners came equipped with umbrellas. 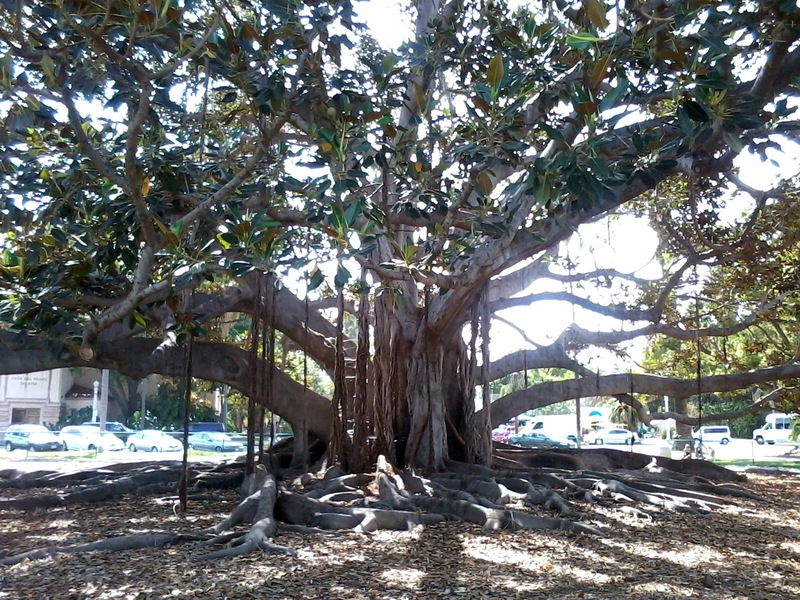 I sought out the shade of a tree and sat on the ground:) The acoustics are so wonderful, the architecture so beautiful. 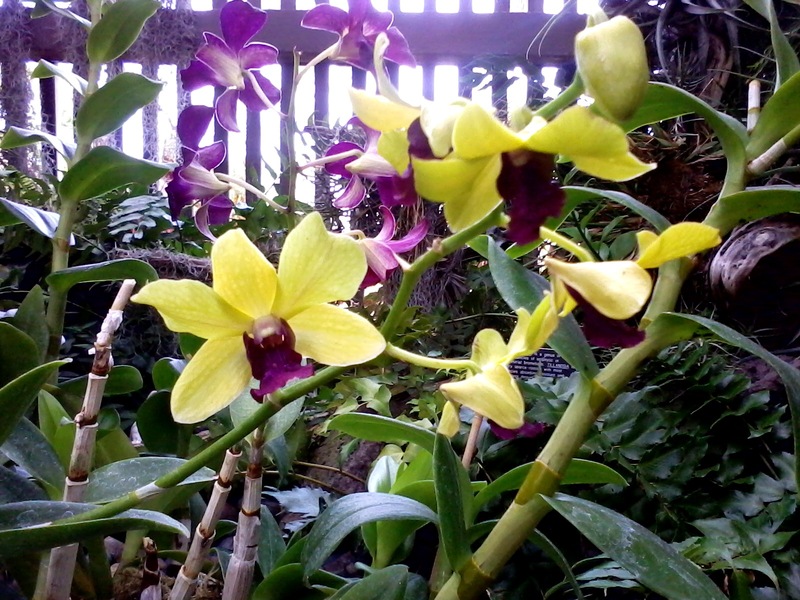 When the concert was over I decided to head to the Botanical Garden. 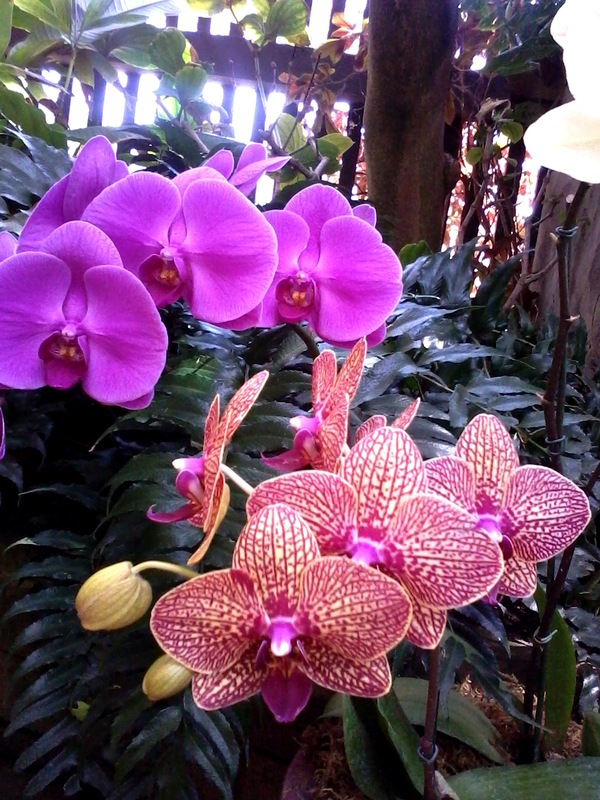 I had read about the orchid show in the garden. 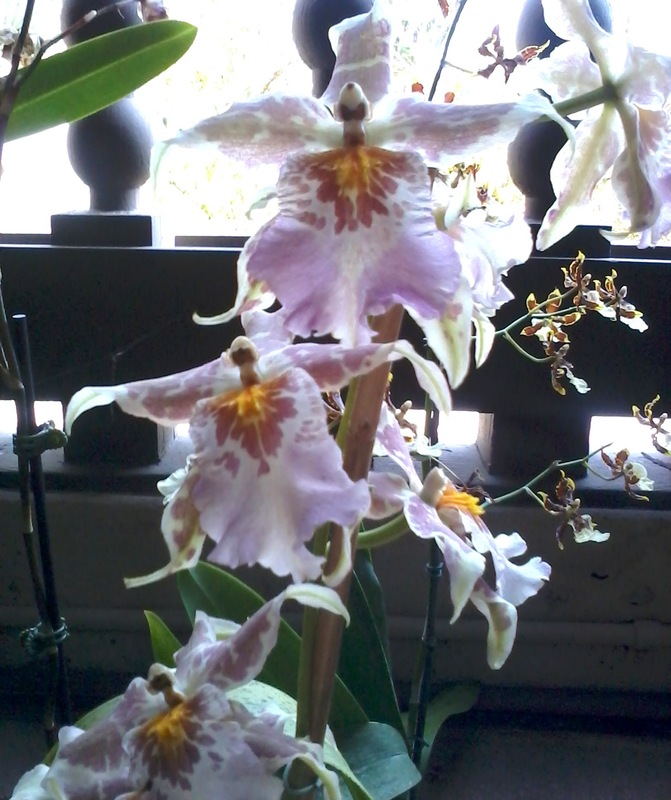 Here are some photos I took of the various orchids. Keep in mind these pictures were taken with a camera phone….low end camera at that, as I haven’t made the move to a smart phone yet. I think the pictures turned out pretty well though. 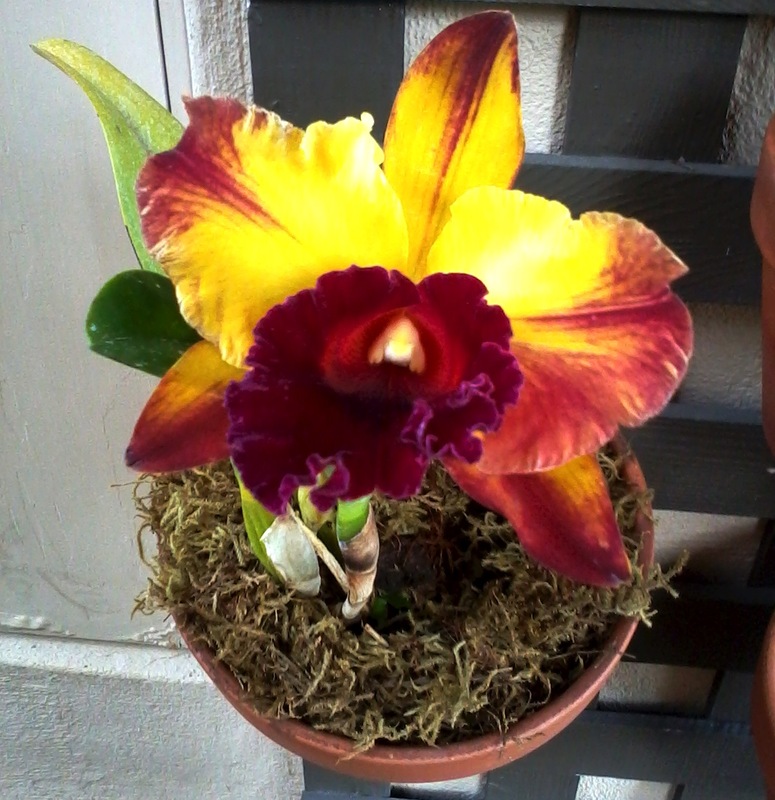 After leaving the garden, I walked by a Father and daughter, sitting on a bench, with a beautiful orchid plant sitting next to them. 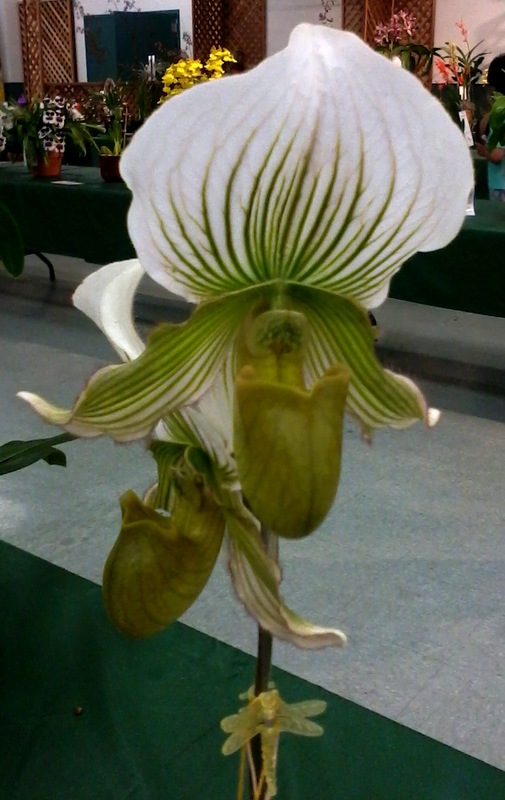 I stopped to comment on it and the man directed me to a show and orchid sale going on in a nearby building. 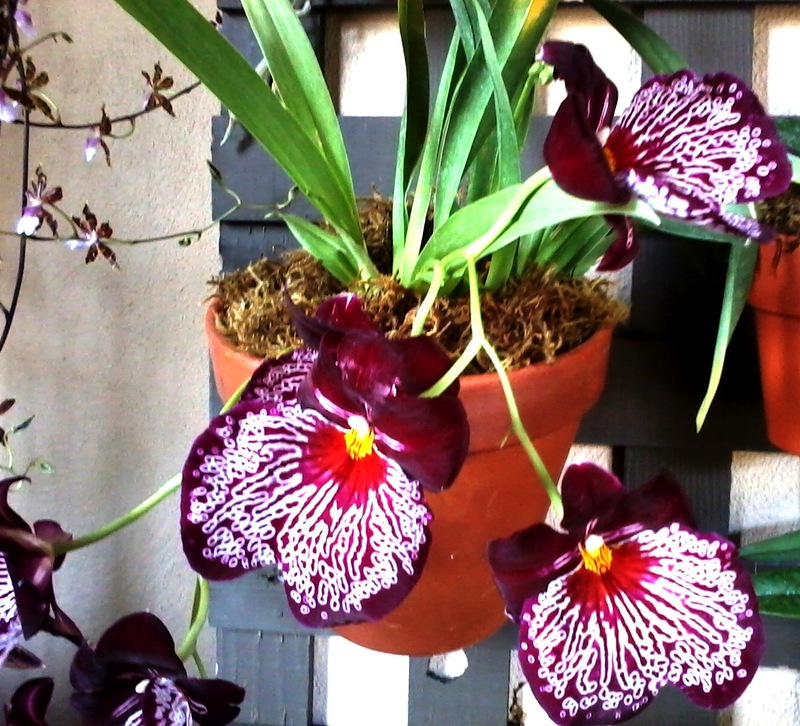 Here are photos of two of the orchids there. Next I headed over to lay on the ground and soak up the root energy of this tree that has the distinction of having one of the largest expanses in the world. 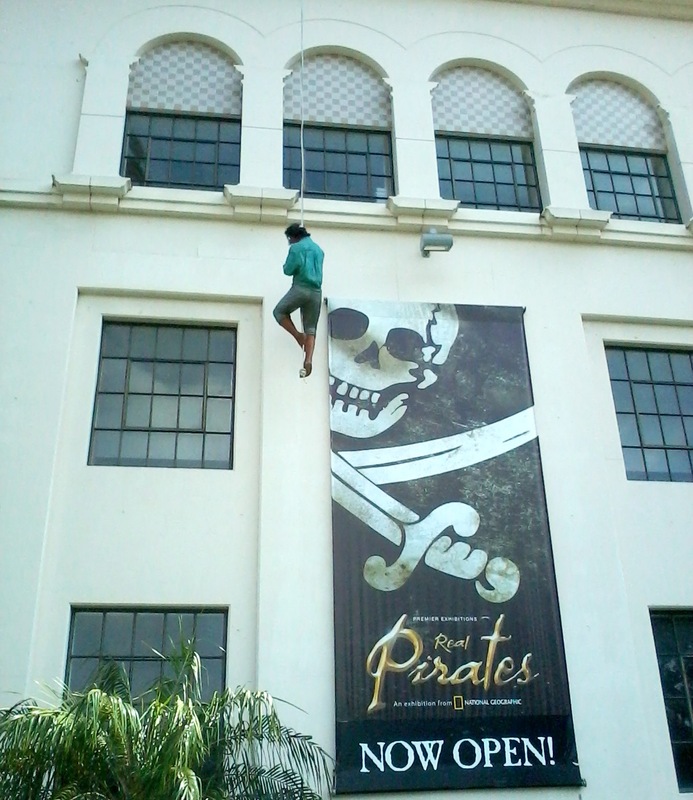 On the way there, I passed by the “pirates” dangling from the building, advertising the ongoing pirate exhibition. 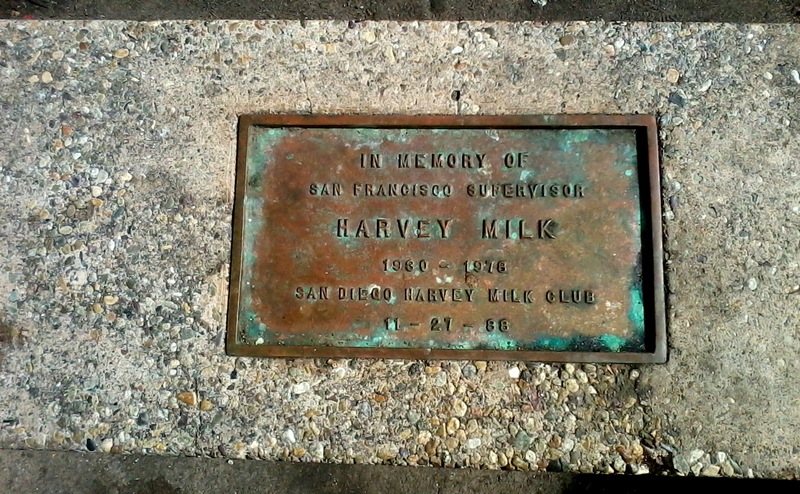 Lastly, on the way back, I stopped near the butterfly garden and noticed a bench memorial for the great activist Harvey Milk. A sweet ending to a sweet afternoon. 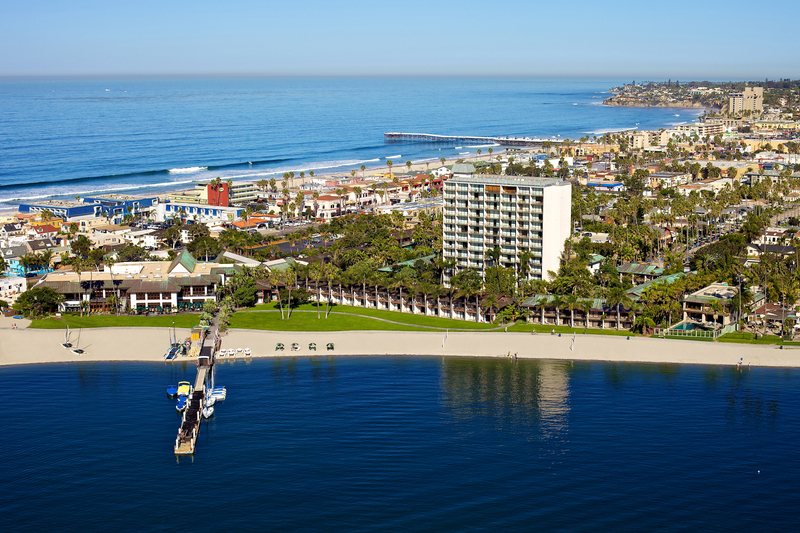 I came to San Diego often as a child, and we always stayed on the ocean side of either Pacific or Mission beach. My parents had some friends who stayed on the bay side and as a kid, I couldn’t figure out why anyone would want to stay on the bay side. I was familiar with the Catamaran, as it was across the street and a block away from where I often stayed on the ocean side. So I decided it was time to visit the Catamaran and find out more about it and the bay side appeal. As an adult, I can better appreciate the peace, tranquility and quiet slower pace of the bay side now, and yet, the Catamaran is not just for those who want to lay by the pool or on the beach next to the bay. 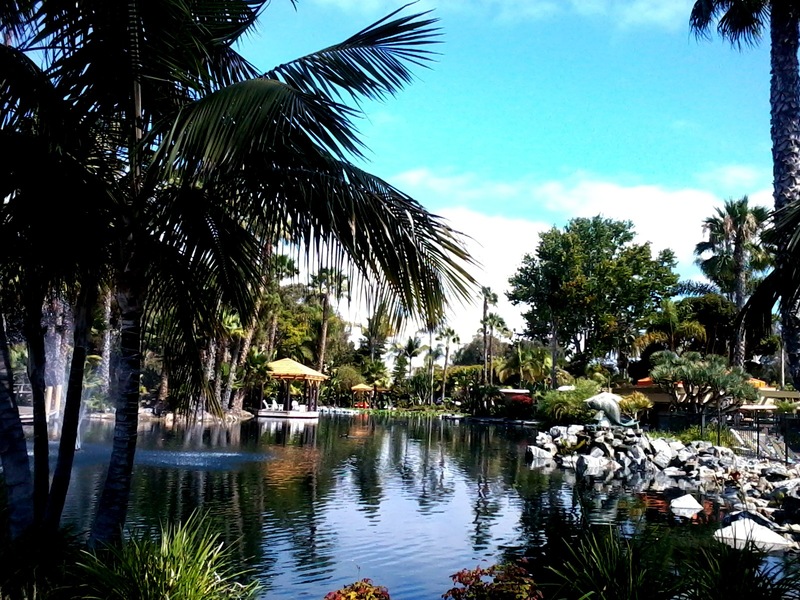 Yes, the resort offers that lush hidden feeling of being in a secluded jungle and yet it has it’s own restaurants, exercise room, spa, numerous water sport offerings and even a steam boat to board to listen to music, grab a drink and dance!, And, since it is located right on Mission Blvd. 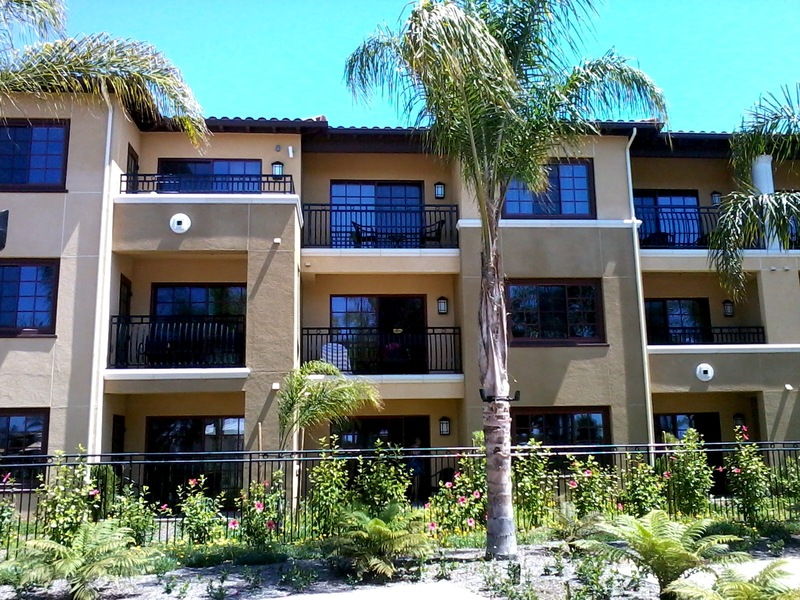 it is just across the street from the ocean, walking distance to stores, and numerous restaurants and night clubs. 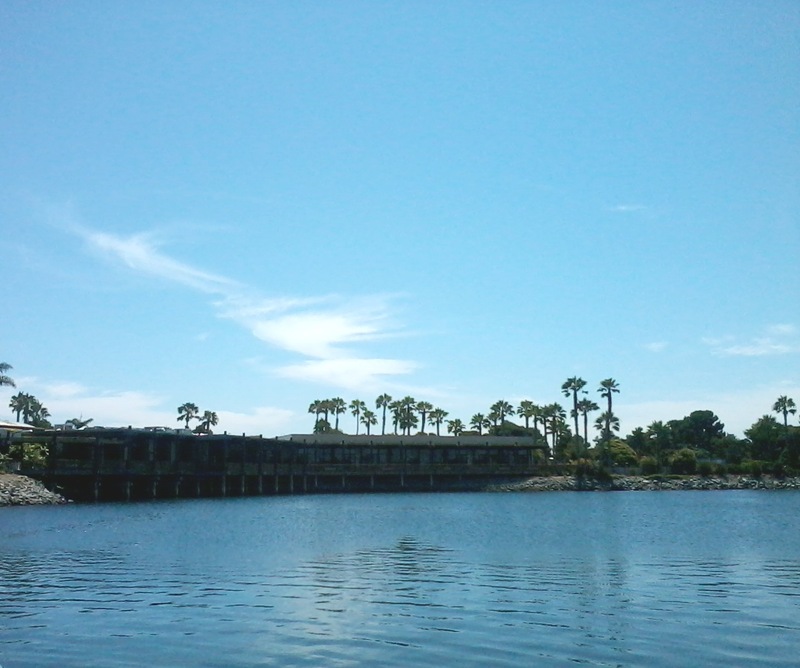 These are a bay side photo of the resort and another photo of the entrance. 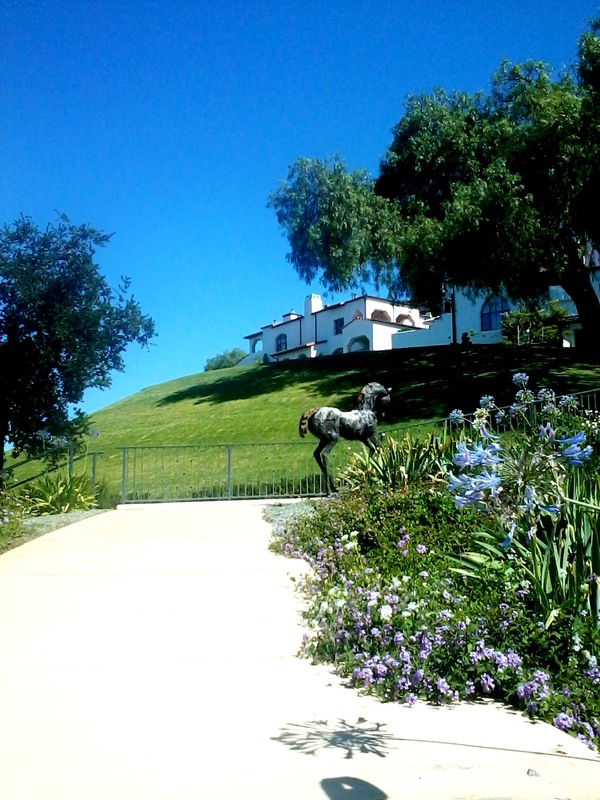 The hotel and surrounding property were originally the summer estate of the Scripps family. and in 1958 William D. Evans bought it. He has remodeled it and added to it using Colonial Hawaiian architecture, materials from around the world, and art pieces especially from the South Pacific. 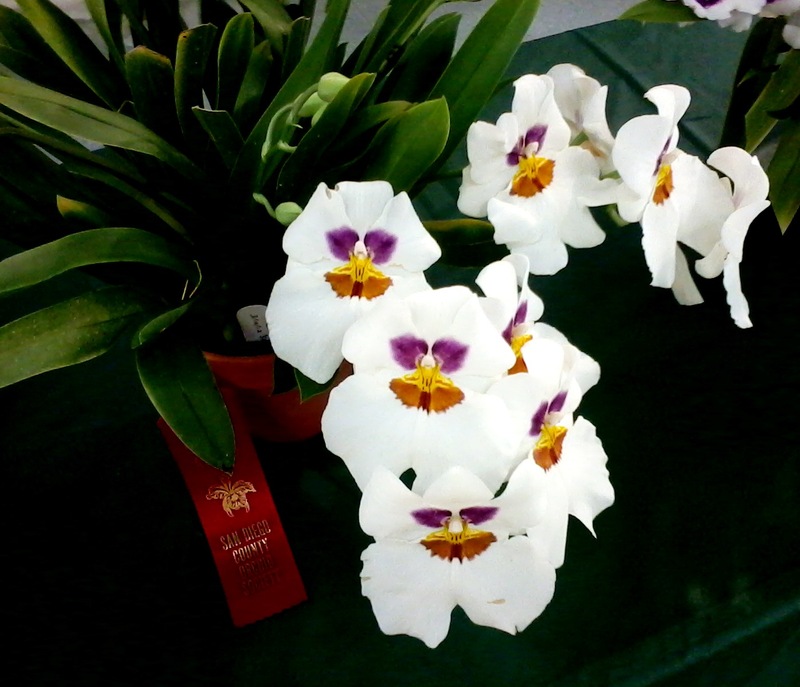 There are more than 1000 species of plants and flowers, 100 varieties of palm trees, a Koi pond, 30 types of hibiscus flowers and exotic birds. The resort is even green certified! 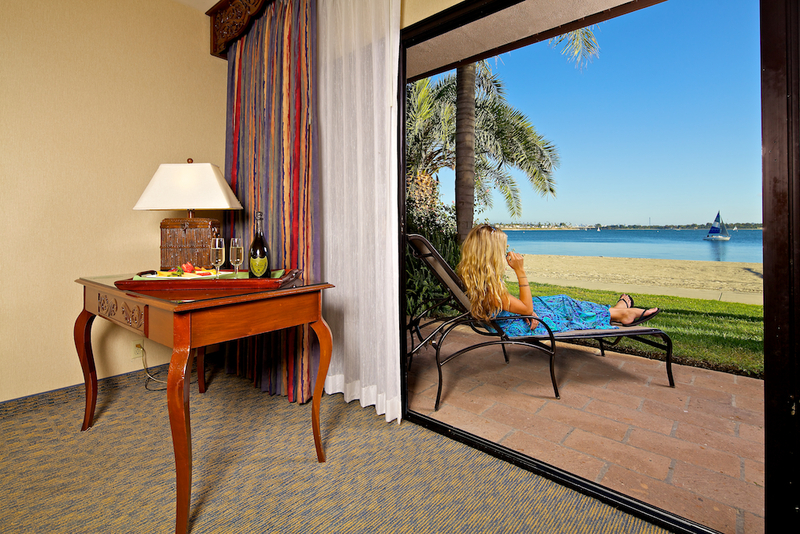 There are 312 rooms, suites and deluxe studios, some with ocean and bay views, some with garden views. 151 of these are standard rooms, 110 are studios, and 51 are suites with full kitchens. These range in size from 329 sq ft to 604 sq. ft. The studios are 430 sq. ft and have kitchens, too. 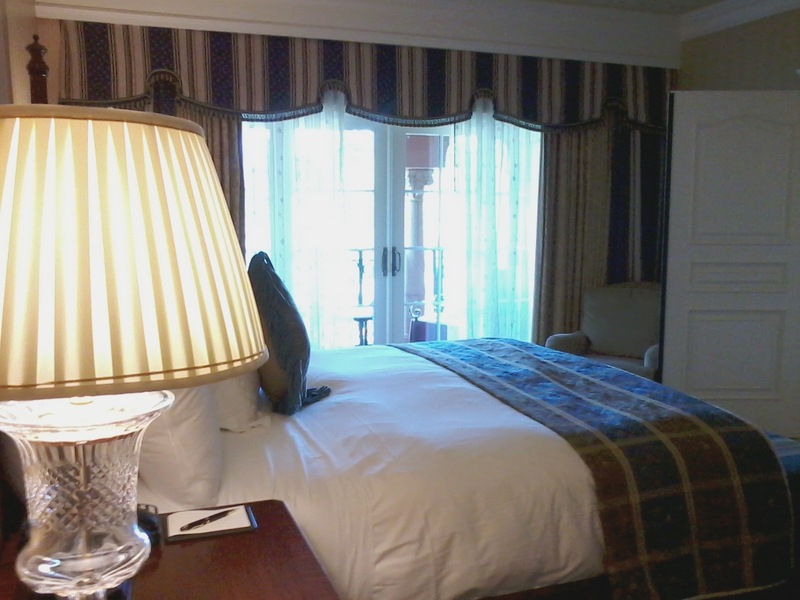 Prices range from $143.65 to $245.65 a night. 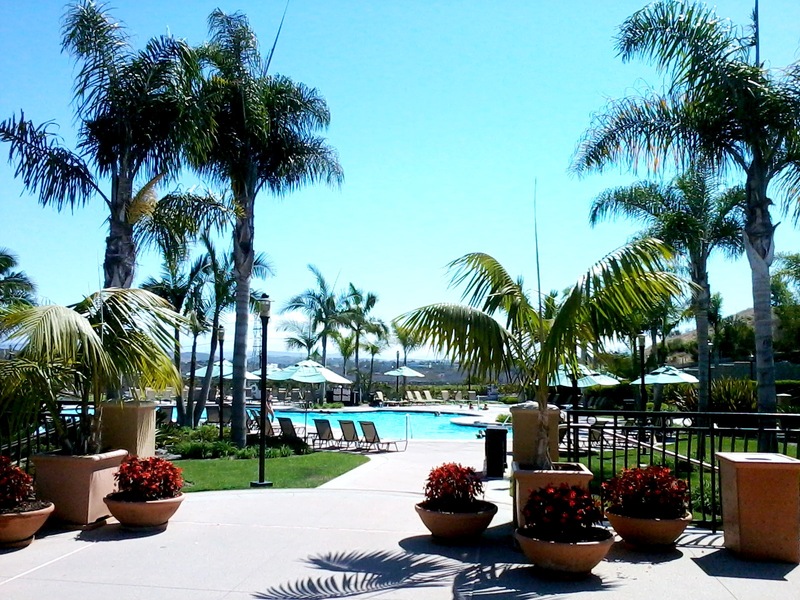 Unlike most resorts there is no resort fee for internet, use of the pool, fitness center, etc. Plus there is a complementary passage on the Bahia Belle historic river boat, with live music, cocktails and dancing, and a tour of the bay. The Bahia Belle runs every night in the summer months and on Fri. , Sat. and Sunday during the fall and winter months. 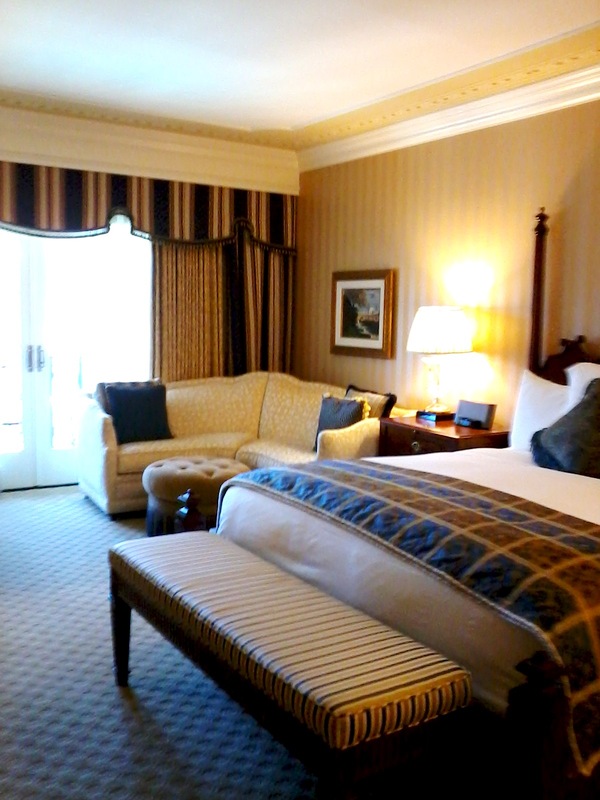 Here is a photo of the lobby and a bay view room. Like I mentioned earlier, there are many activities available at the resort. 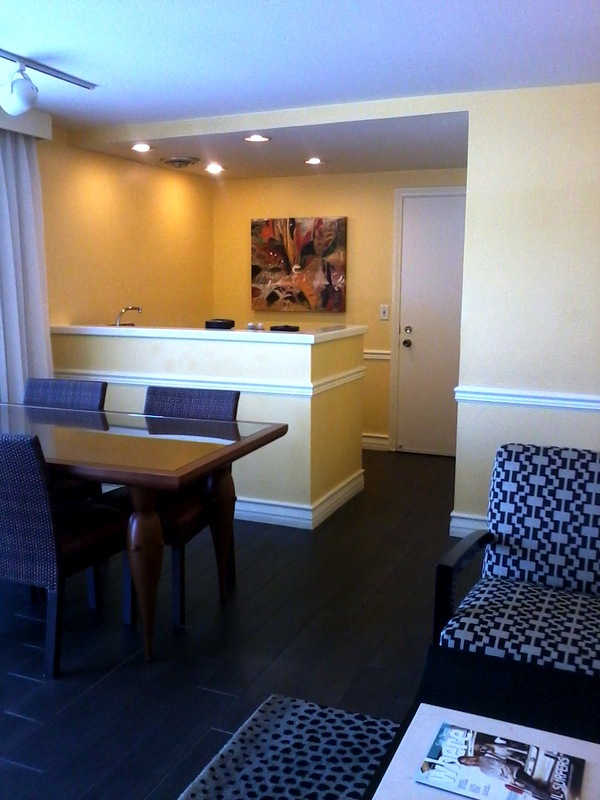 There is a business center, fitness center, outdoor whirlpool tub, heated pool, video arcade and gift shop. 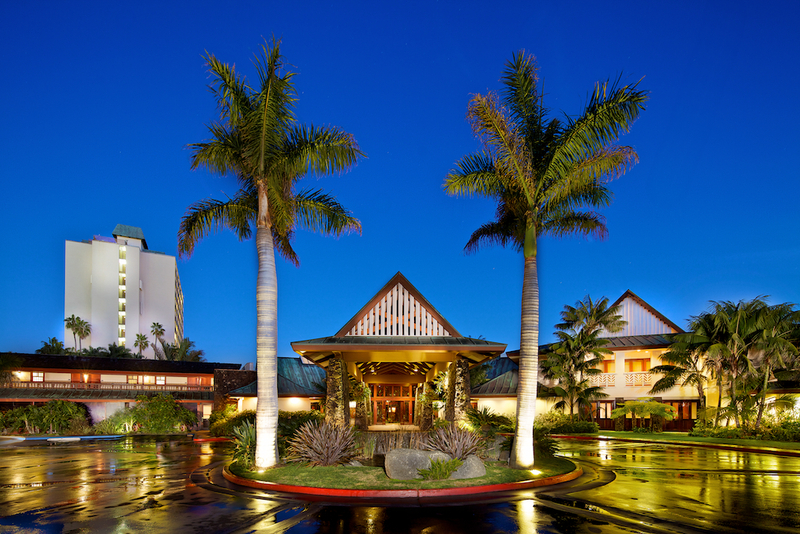 During the summer there is a kids camp, live music, bird shows, and a Polynesian luau with music, food and entertainment. Other activities offered are sailing, surfing lessons, biking, skating, water skiing, wake surfing, kayaks, paddle boards, boogie boards, power boats, ski boats, segways, all available to rent right on the property. My favorite is the fun cats, which look like big lounge chairs but they are powered and you can just lounge and cruise the bay! Chairs and umbrellas are also available for lounging on the beach. 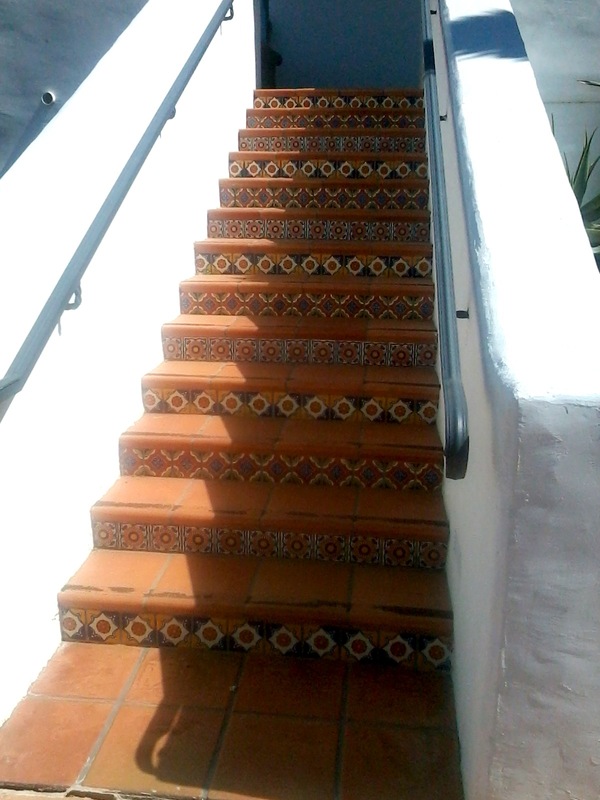 You can also access the bay sidewalk and walk for miles. 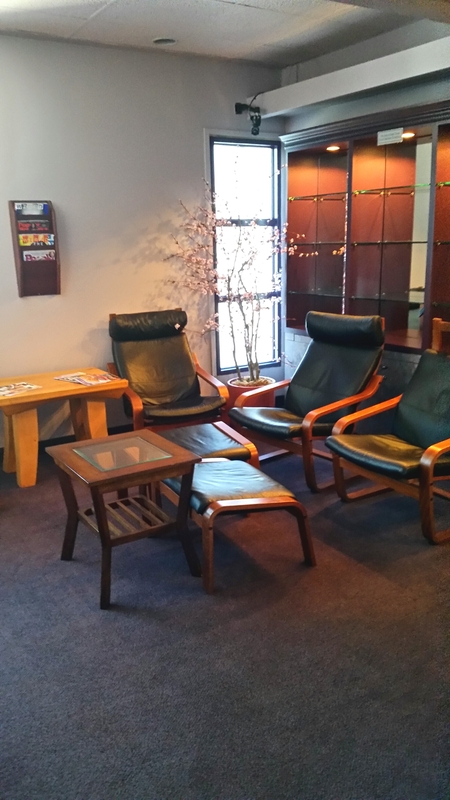 Photos are of the lounge chairs next to the whirlpool which is next to the spa. You can see the water sport rentals in the background. Also, photos of the pool, pier and beach chairs. As a long time holistic therapist I always enjoy seeing the spa, and the one at the Catamaran did not disappoint! I loved the beautiful tiled floors, lovely cabinets, steam and dry sauna rooms, tranquility room, beautiful locker rooms and all the wonderful spa treatment offerings. 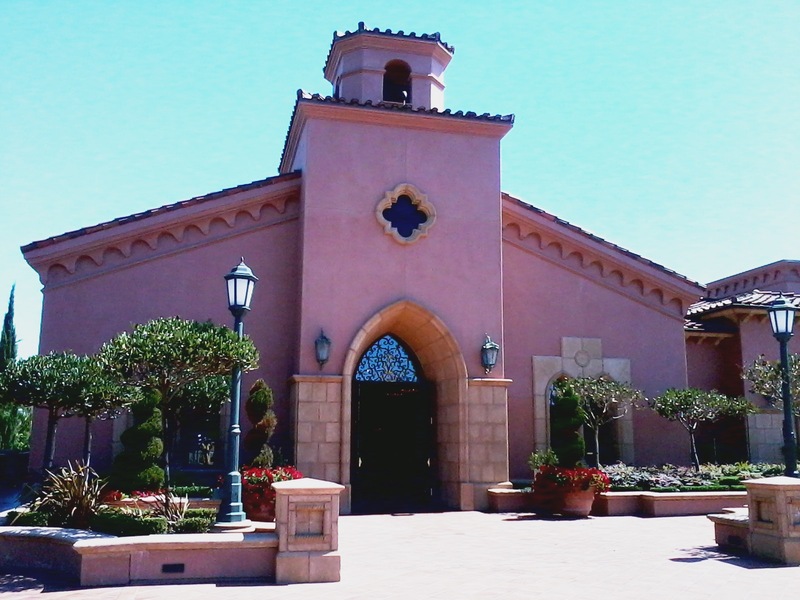 The spa was built in 2005 and is 9300 sq. ft. It has 10 individual treatment rooms, a ritual room for combination treatments, a Vichy shower room and a couples treatment room. 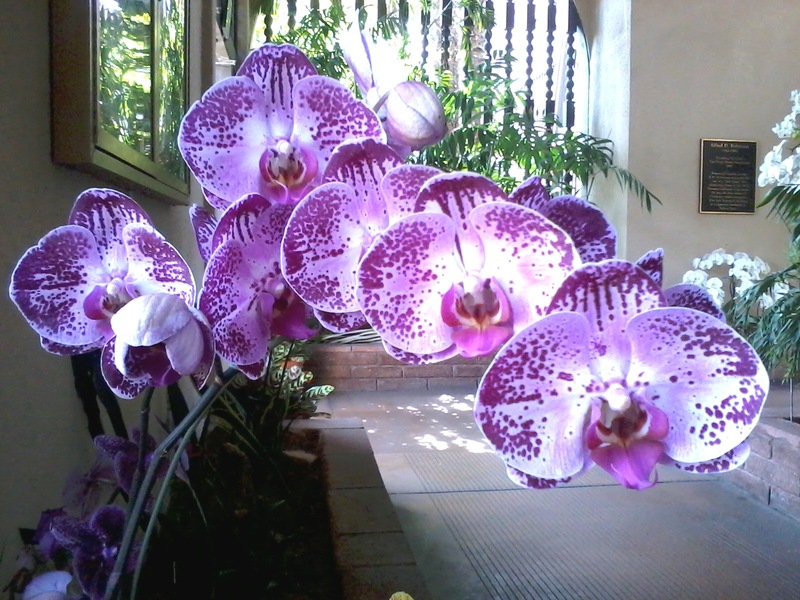 The treatments all have marine and botanical elements. 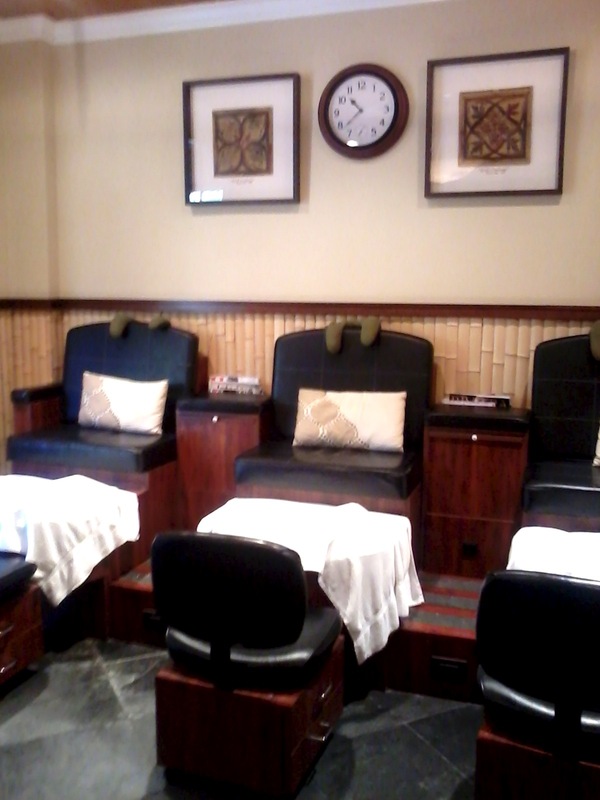 There are skin and body treatments offered, along with a hair and nail spa. 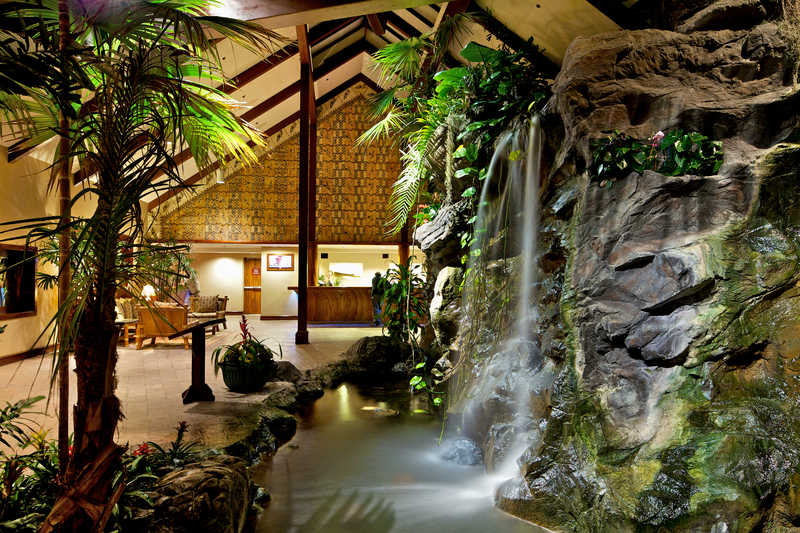 There are hydro therapies, scrubs, wraps, water therapies, and they all have a South Pacific or Asian influence. 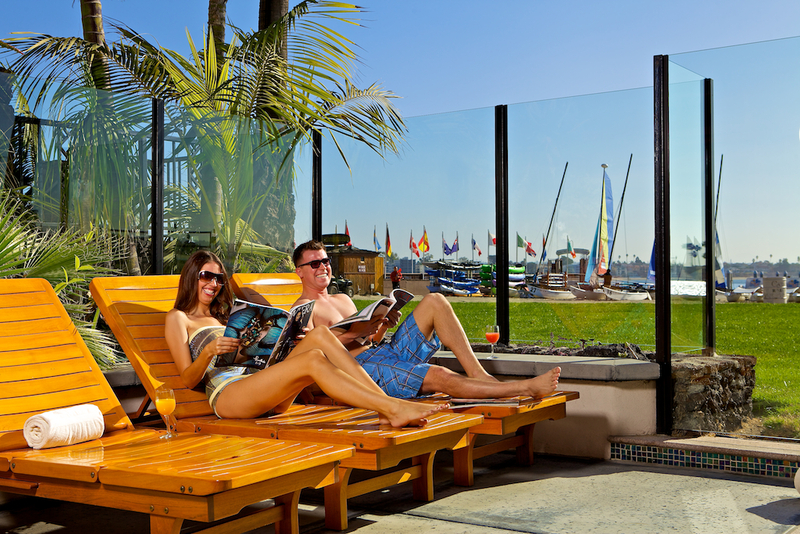 There are monthly specials and locals are encouraged to come and partake in the spa, too. Along with a spa treatment, locals can enjoy the use of the pool and beach chairs, making a day of it. 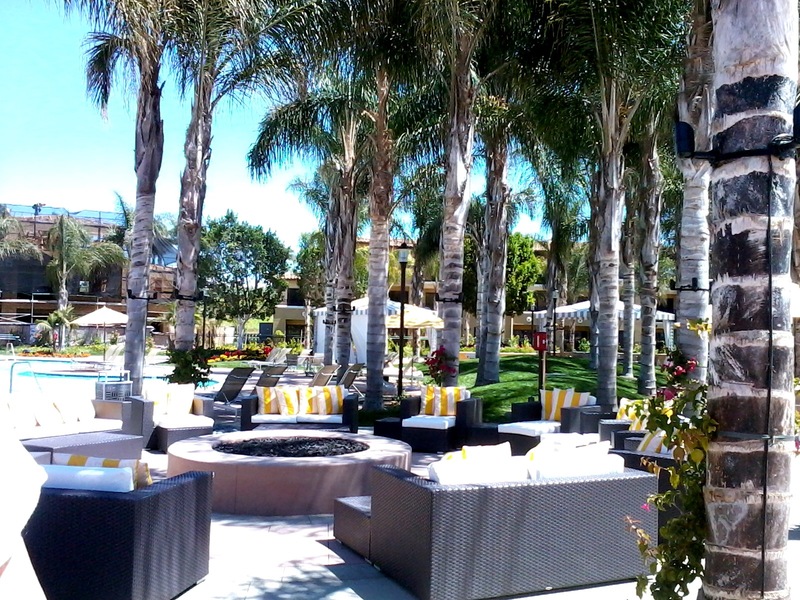 During the summer, the pool bar and grill is open. The Atoll restaurant is open for breakfast, lunch and dinner and has a Sunday Champagne brunch. Morays lounge has live music and offers a bar and food as well. 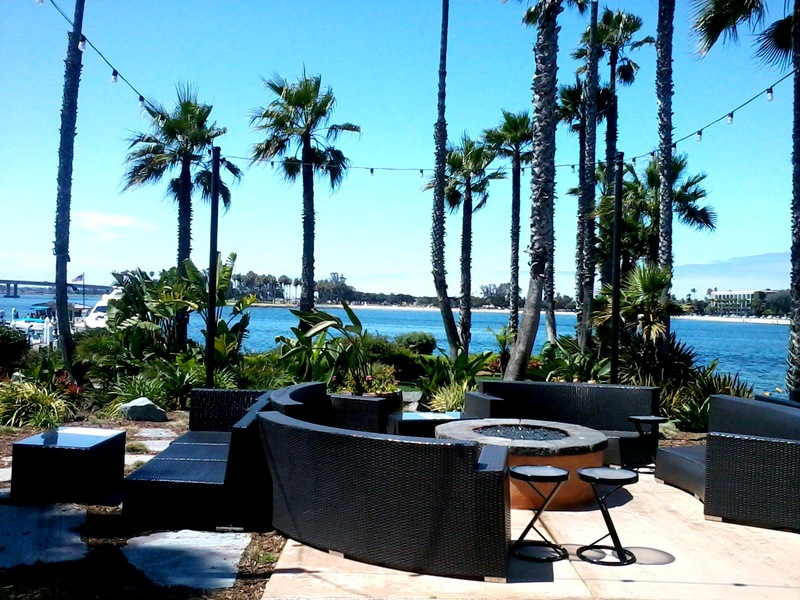 This is a photo of the fire pit in the outside seating area of Moray’s lounge. 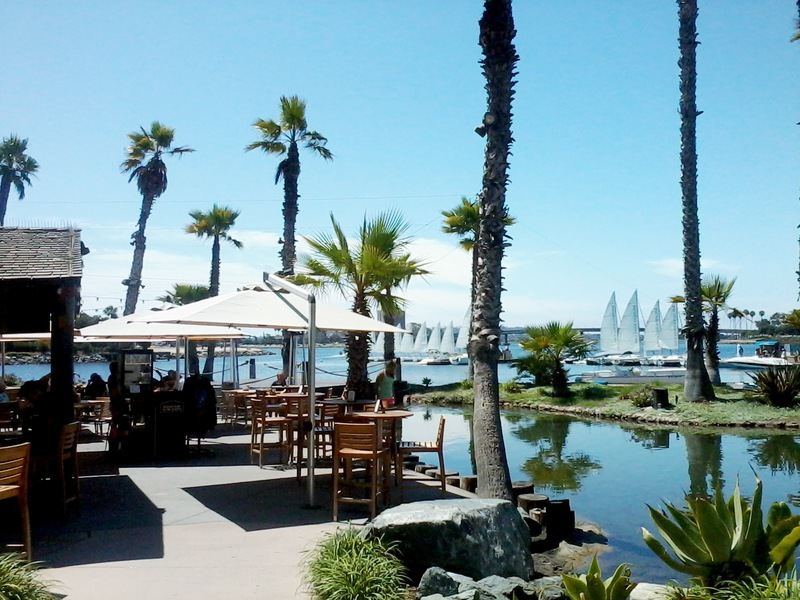 The Catamaran is a lovely place for business meetings, weddings and other gatherings. 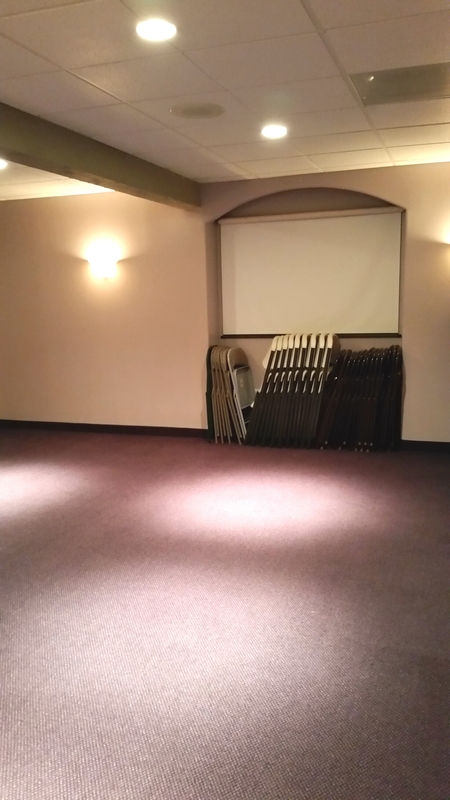 There are 14 function rooms available; 20,000 sq. 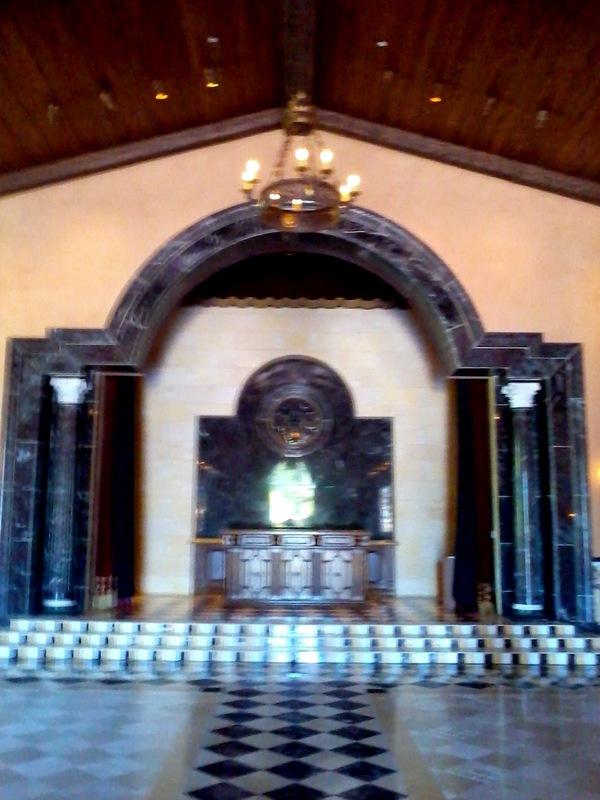 ft. of contiguous space; and room for 30-450 guests. In addition to the beach area and function rooms, you can even book one of the two 19th century 100 ft. Sternwheeler boats and host up to 575 guests on it! 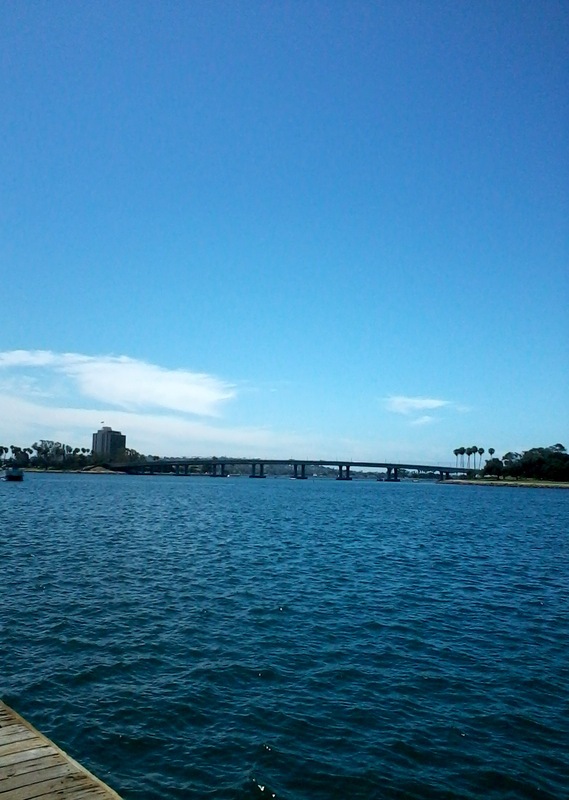 I am so glad that I took the time and had the opportunity to widen my views of the delights of staying on the bay. 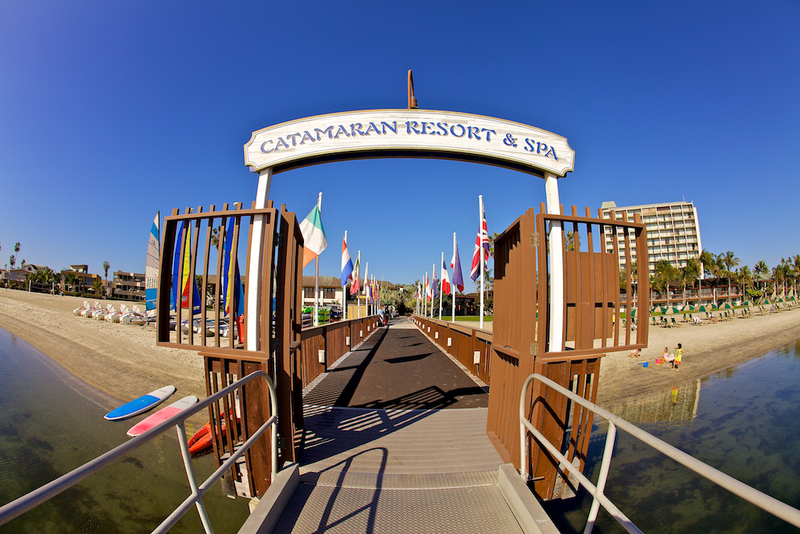 You can find out more about the Catamaran on their website http://www.catamaranresort.com/san-diego-resorts/. Come and explore it for yourself!. Photos are all courtesy of the Catamaran Media relations manager. On Tuesday my friend and I received a wonderful tour from the delightful German assistant front desk manager. 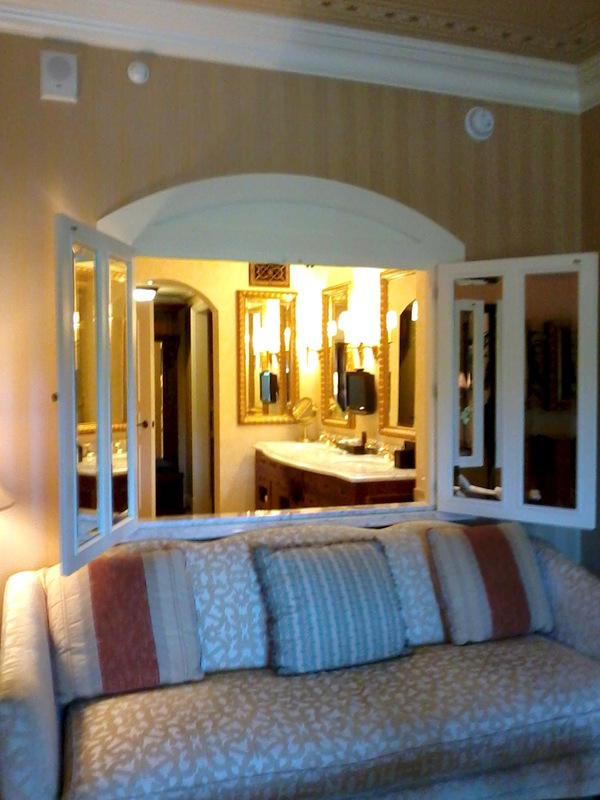 We were lucky to be shown several rooms and suites including the palatial Presidental suites. This resort is one of only 6 resorts in the world to be given 5 diamond/stars for their spa, resort and restaurant and one of only 23 five star spas in the country. It was built in 2007 and elegant touches are everywhere from the walls, ceilings, floors, floor coverings, lighting fixtures, furnishings, windows, and even mini-bar offerings. 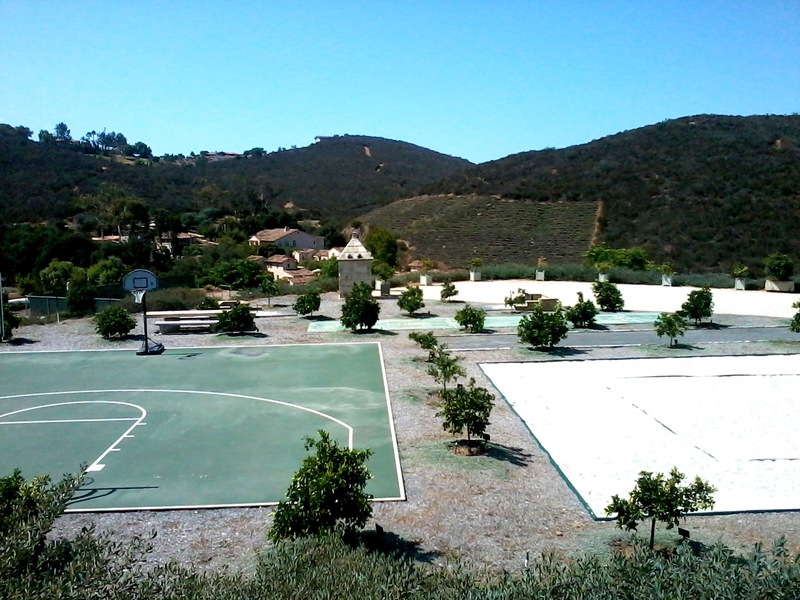 The resort is located next to the Los Penasquitos Canyon Preserve. 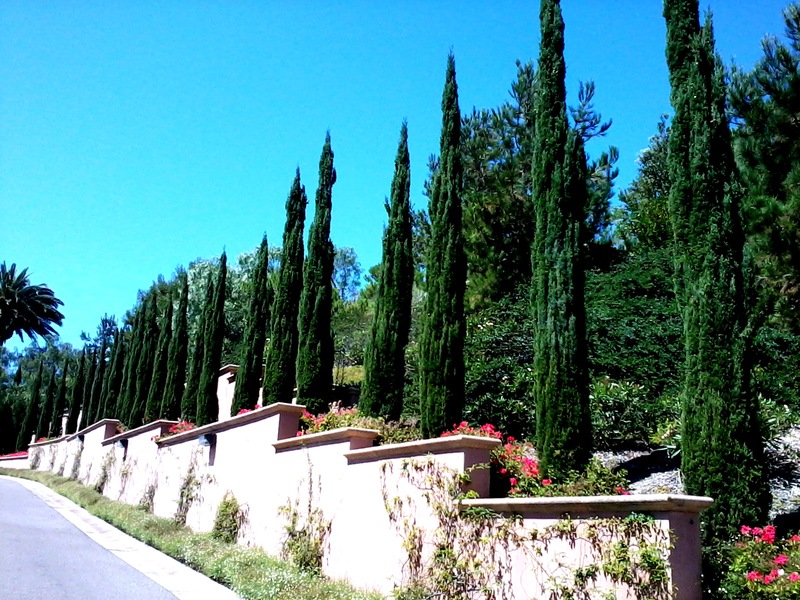 It has several green initiatives and works to support the preserve. The resort uses energy efficient lighting; recycling; water conservation; china/glass/cutlery/cloth in all business retreats and large gatherings to avoid waste; organic/in season/local/sustainable/fair trade food as much as possible; chemical free dry cleaning; organic fertilization on the landscape; re-use of green waste for mulch; minimize over watering; use a filtration system at their wash station; and work to protect the wetlands using native re-vegetation and other initiatives. They even have a manager for green initiatives and sustainability. There is an 18 hole Tom Fazio designed golf course, 7 acres of practice areas, a junior academy and a 50, 000 sq. ft. clubhouse with the Club M restaurant that offers food and entertainment. 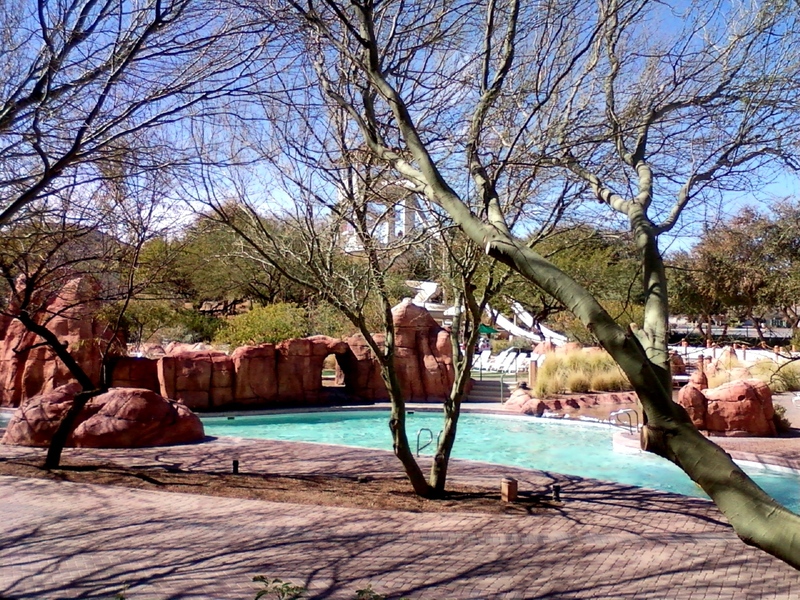 There are 4 heated pools in the resort, including an adults only relaxation pool located next to the spa. There is a bar next to a couple of the pools, offering light casual dining. There is also white sand seating. 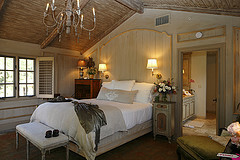 There are various guest rooms and suites to choose from along with over 4500 sq. ft. Villas. The guest rooms range in size from 550 sq. 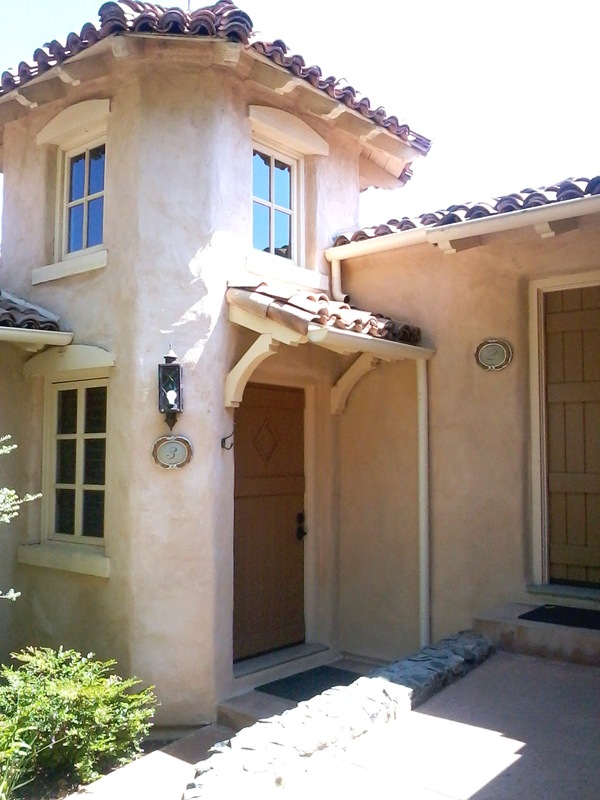 ft for $495 a night, to 2840 sq. ft Presidential suites that rent for $5000 a night. 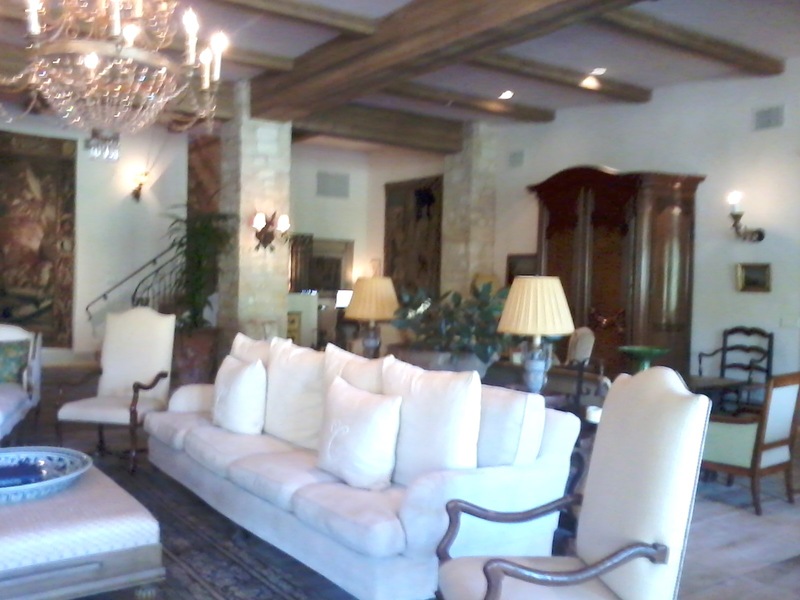 The Villas rate is $6000 a night. There are various packages available. There are several dining options including the 5 star Addison, the more casual yet still very elegant Amaya Restaurant, the lounge that serves afternoon tea and light offerings, pool dining, Club M next to the golf course, and several private dining venues in the wine and Champagne cellars. Here is a photo of Amaya. A friend ate there and was quite impressed with their large vegetarian menu. Of course they have other food as well. As I mentioned, the spa is also 5 stars. I was unable to tour it. 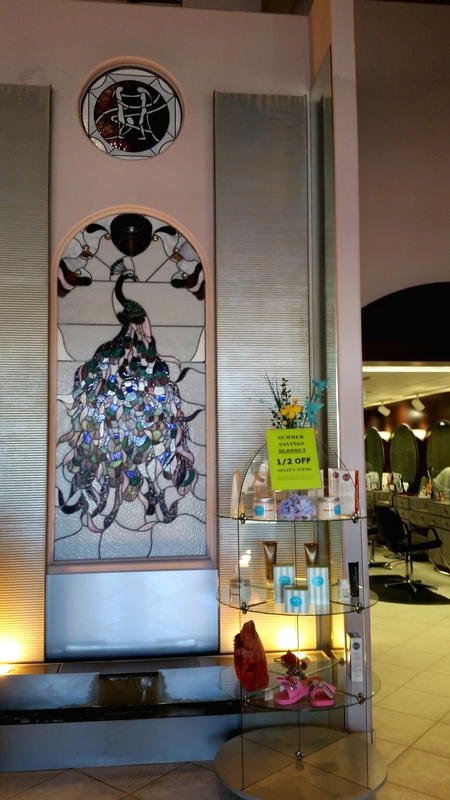 They have 11 treatment rooms,, have wet and dry areas for treatments, whirlpool, scrubs, Vichy shower treatments, massage, lymph massage, wraps, facials, waxing, a salon, and various packages available combing scrubs, massages, facials and wraps. 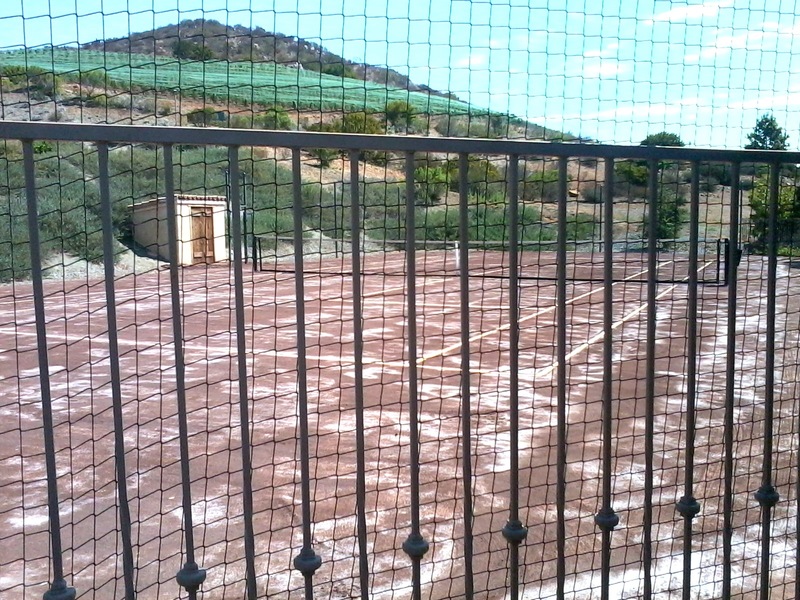 There is a fitness center with fitness and movement classes, including yoga and meditation and tennis. There is an explorer club for children ages 5-12, beach service to transport and set you up at the beach, surf school, kayak tours, picnics, lawn games, and horseback riding and instruction offered. 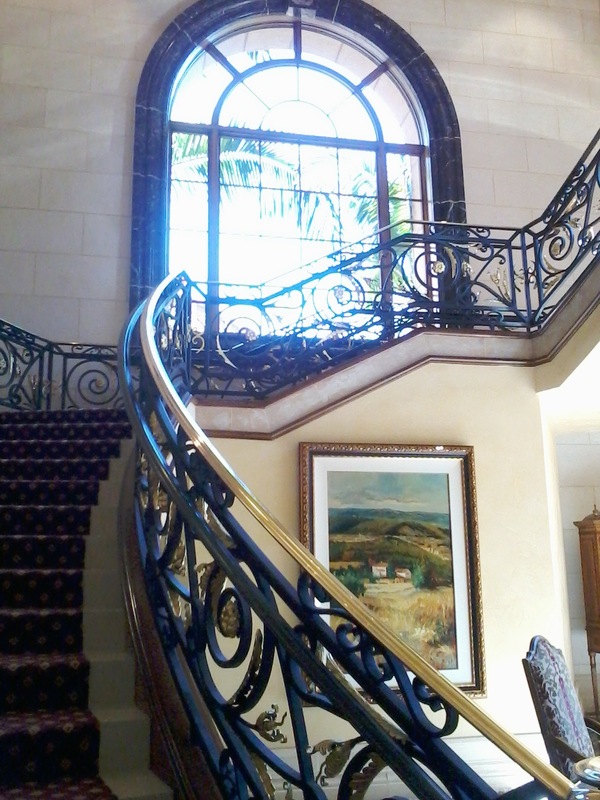 There are many events available such as: wine tasting; behind the scenes food and wine secret classes at the Addison; a painting and wine event; happy hour; Sunday concerts; movie night; sand castle building on the beach; hikes; Italian movies; perfume making; and an art and architecture tour. The various ball rooms can be divided or opened up for various size venues for weddings, corporate retreats and other large events. 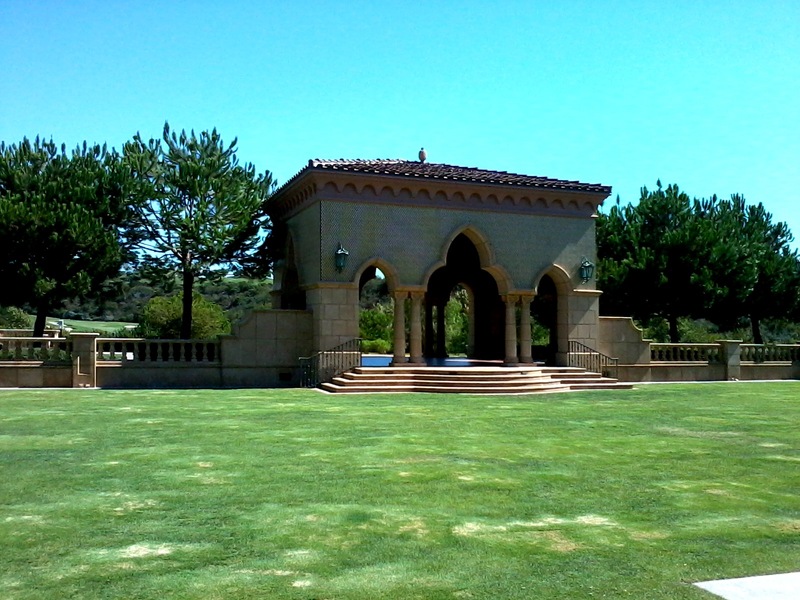 I love this large lawn area that is available for weddings and the gazebo known to be a place for romantic engagements. 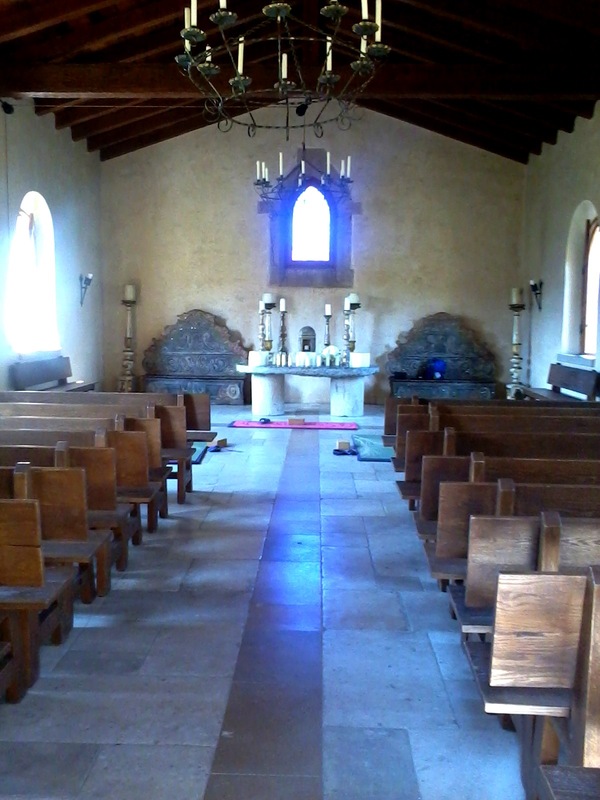 The Capella is another beautiful chapel like area available for weddings and business meetings. Everywhere you look from the picturesque driveways to the elegant seating areas in the foyers to the luxurious hallways connecting the guest rooms, to the striking stairway, it is all designed to provide a high end resort experience, and yet is still very warm, inviting and friendly. I have been a holistic therapist, trainer and coach for over 34 years, and have worked in various resorts, so being able to tour a spa is always a special treat. And what a treat this small yet elegant spa is to see. They are dedicated to using mostly organic products in all of their treatments and a few of the lines are produced locally. The spa director, Carol Holguin, described the Kimberly Parry Organics line produced locally, how Kimberly makes up the batches when ordered so they are fresh and how they’ve been able to go to the facility and ask for additions and alterations to the various ingredients to produce signature products for their treatments. 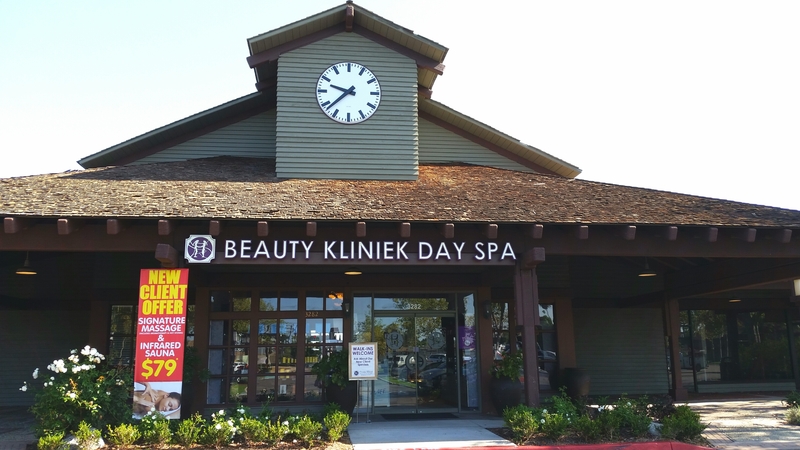 All body treatments are done with Kimberly’s line and all facial treatments are performed with either the Kimberly Perry line or the Hungarian line, Ilike, which is made up of fruits, vegetables and herbs. Several lines are carried in the lobby for purchase, too. Carol also showed us a device used for non-invasive face lifts, called nuface, using a microcurrent. She has used it and says in five minutes it produces visible results. 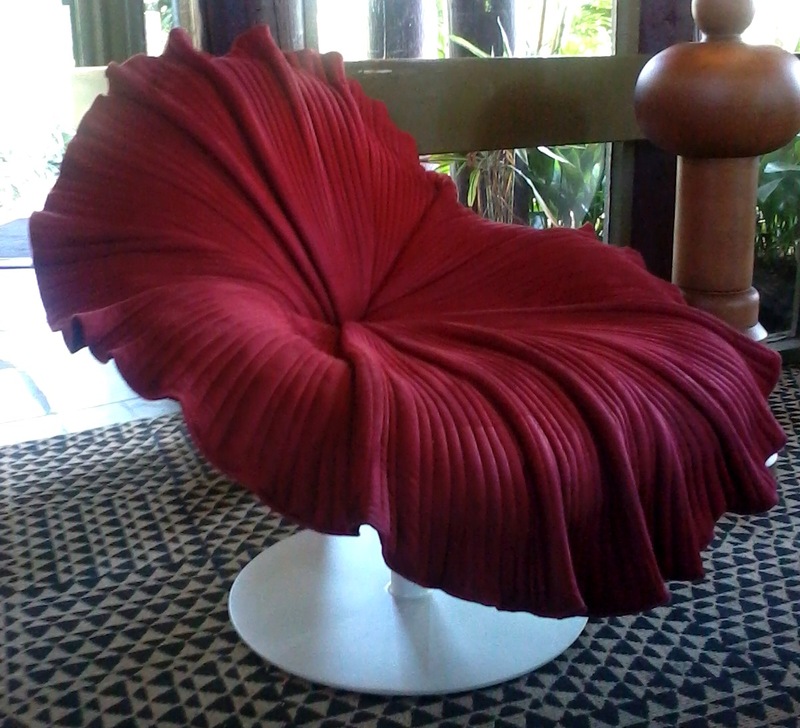 This is available for purchase in their lobby. She also showed us poultices filled with herbal pearls that are used to perform both massages and facials, a signature treatment. The spa has 2 facial rooms, 6 massage rooms, including a couples massage room; a manicure/pedicure station that looks out to the lovely pool; locker and relaxation areas for both men and woman; a eucalyptus steam room. Various massages, body treatments, and facials are available alone or in a package. I love how dedicated they are to organic product; water conservation and other green initiatives; and all they do to support local guests as well as guests of the resort. During the summer they have bi-monthly happy hour offerings with various treatments, vendors, and food. During the off season these are offered monthly. Oct. 4th-6th, they are offering a weekend of wellness with classes, workshops, treatments, and wellness consultations. 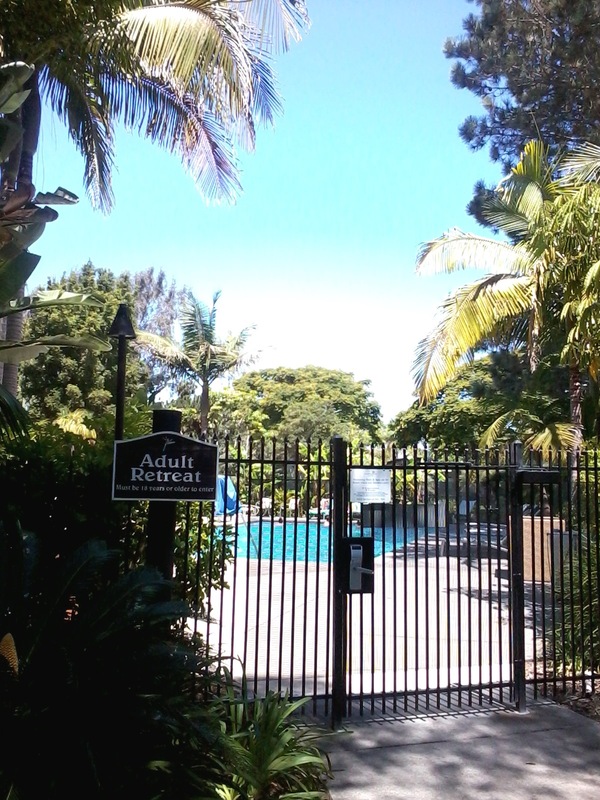 My favorite was the special of a lunch, use of the pool, steam room, outdoor hot-tub and fitness center, all for only $5 added to the purchase of a 50 min. treatment. 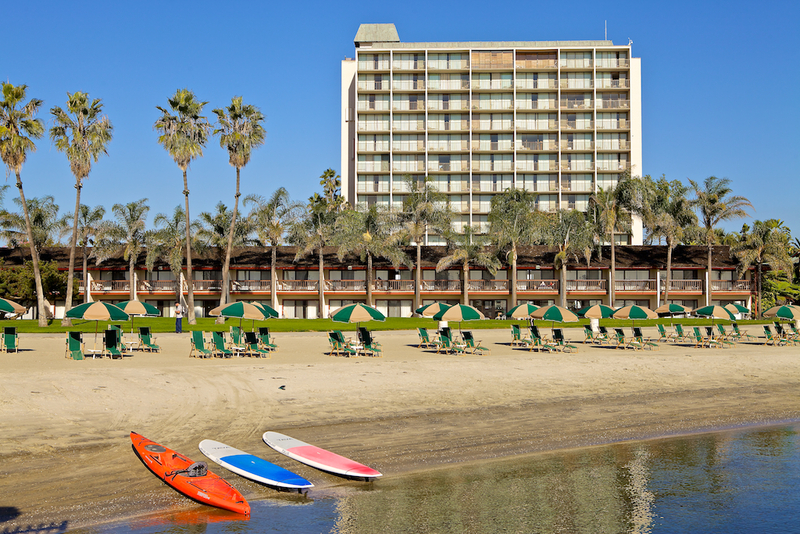 Most resorts charge a fee of $25 for spa, pool and fitness center use alone. They also cater to small groups, wedding groups, etc. 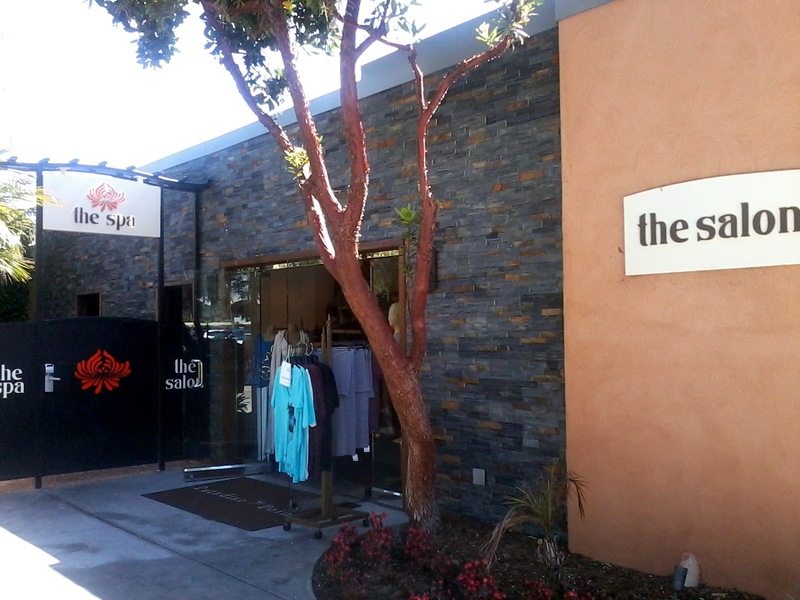 Here are some pictures of the spa. All are photos taken from their website except for the photo of the women’s locker room. 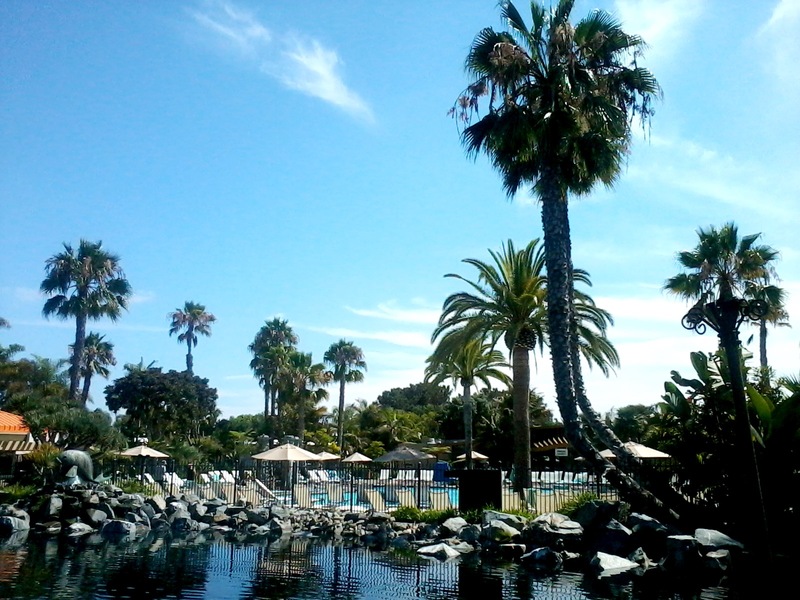 I was quite impressed with the Sheraton Carlsbad resort as well. 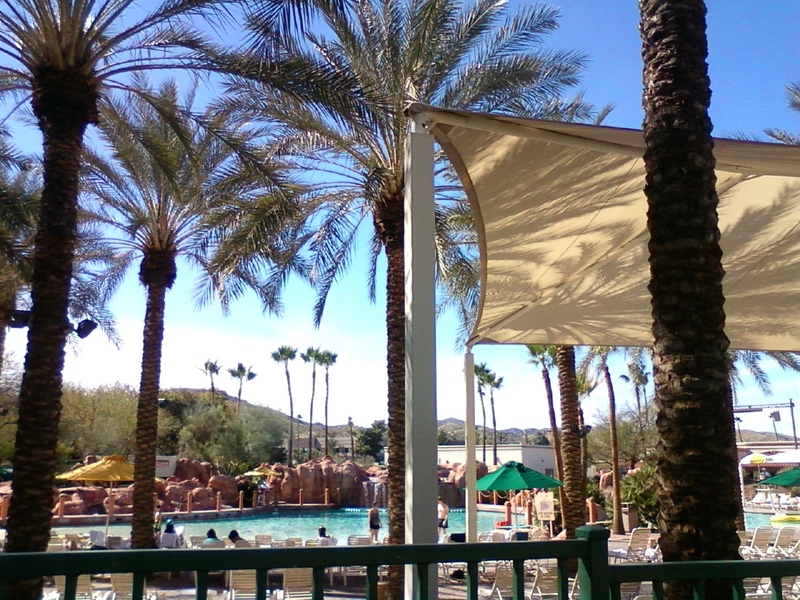 They are connected with the MarBrisa time share, too, so guests are welcome to use the main pool as well as pools connected with the time share. They are in the process of building some new timeshare units which adjoin the new two pool area called “The Cove”. The cove is a lovely area with what will eventually be a family pool and an adult pool, a bar, outdoor pool and ping pong tables, and food service at the pool, plus several lounge areas. The pool can be partially rented out for groups. The first and last photo are of the main pool. 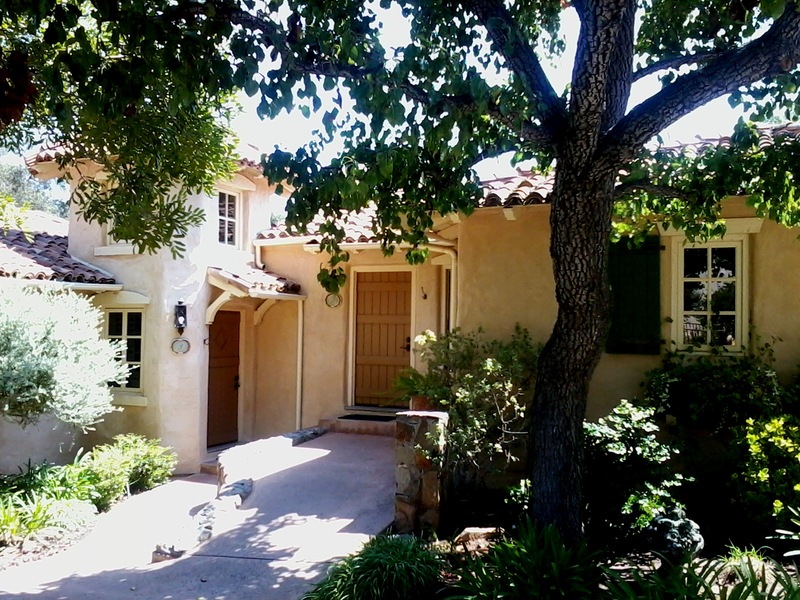 The last photo is taken from the website and includes a picture of the rooms. 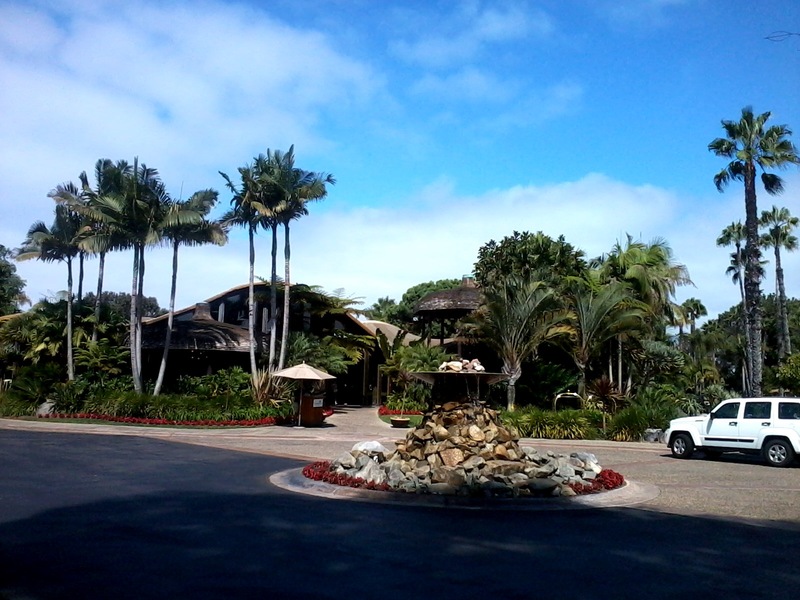 The other three photos are of the Cove and the new MarBrisa time share units. 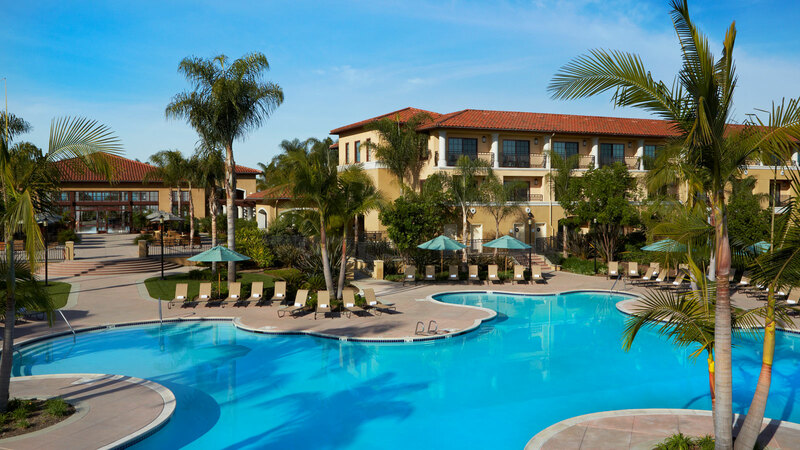 The Sheraton Carlsbad is located right next to Legoland and has a private entrance to it, plus special rates to explore it. 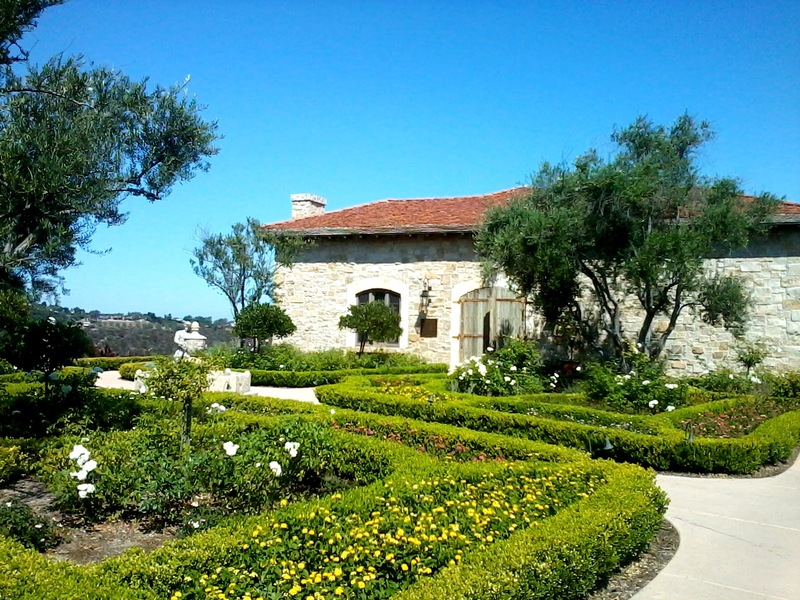 I love the Mediterranean architecture and how lovely the landscaping is throughout the property. They are also next door to the Crossings Golf course. 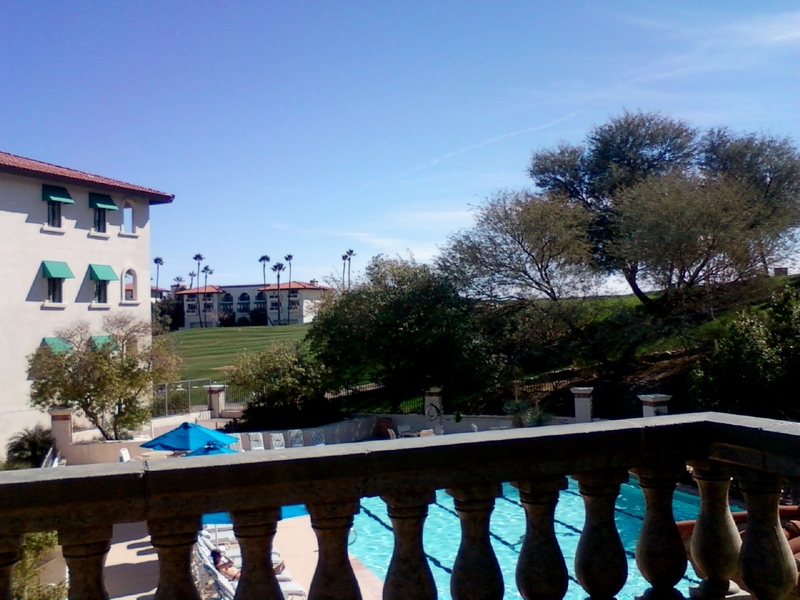 The resort has ocean views and all rooms have patios and balconies that face beautiful scenes of flowers and gardens, the ocean, the canyon or the fairway. 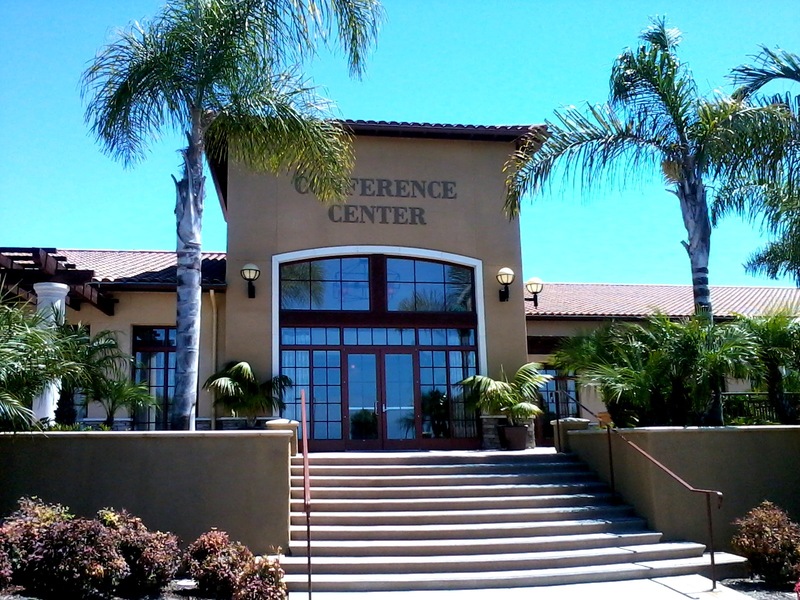 There is a large conference center and many companies hold meetings and retreats here as well as having business travelers stay here. 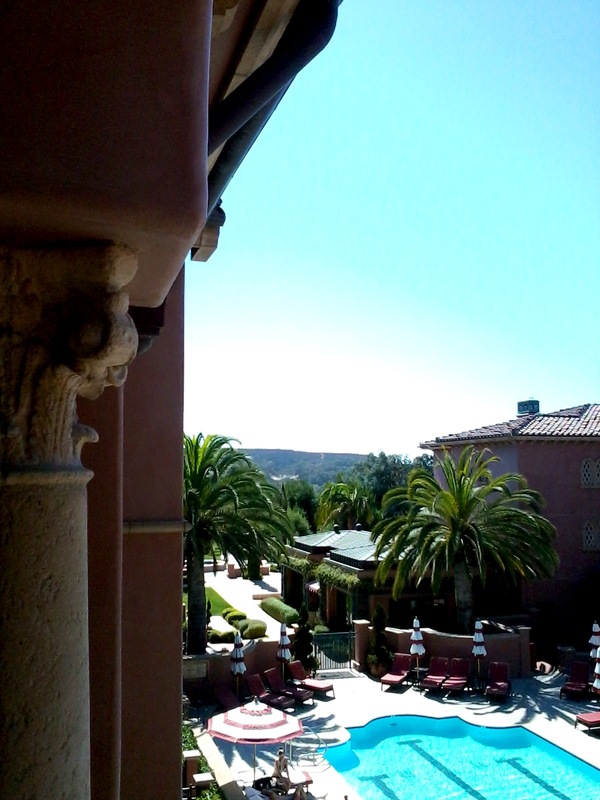 There is 40,000 sq ft of meeting and event space for corporate retreats, weddings and other large gatherings. 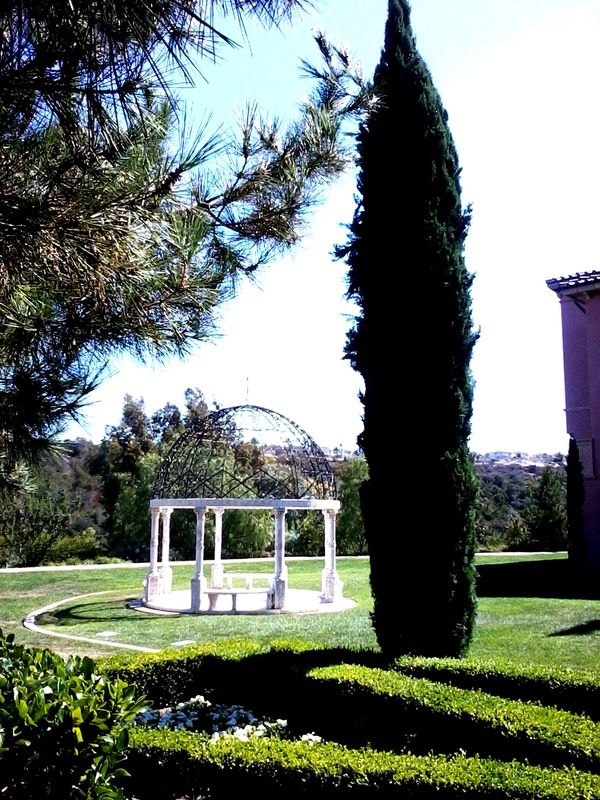 There are several outdoor spaces available as a sweet wedding setting. 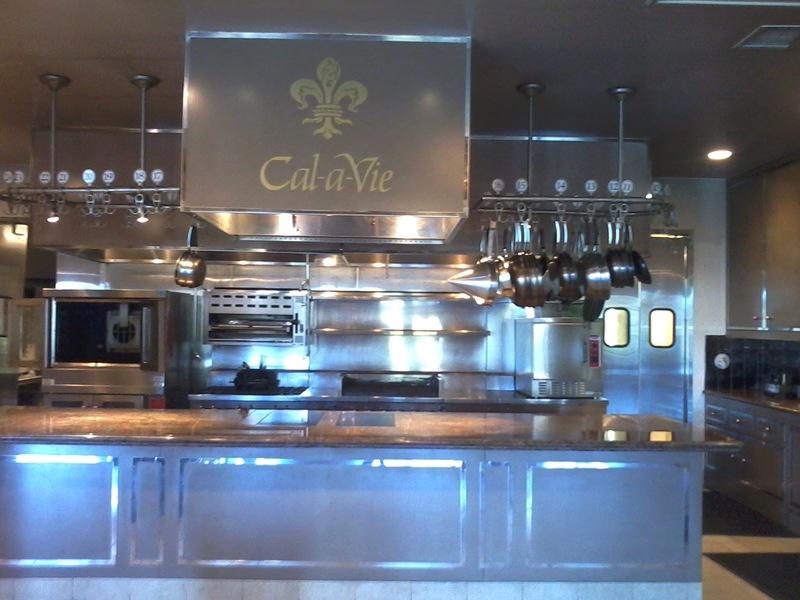 Their Twenty/20 restaurant has recently been remodeled and has 5200 sq. 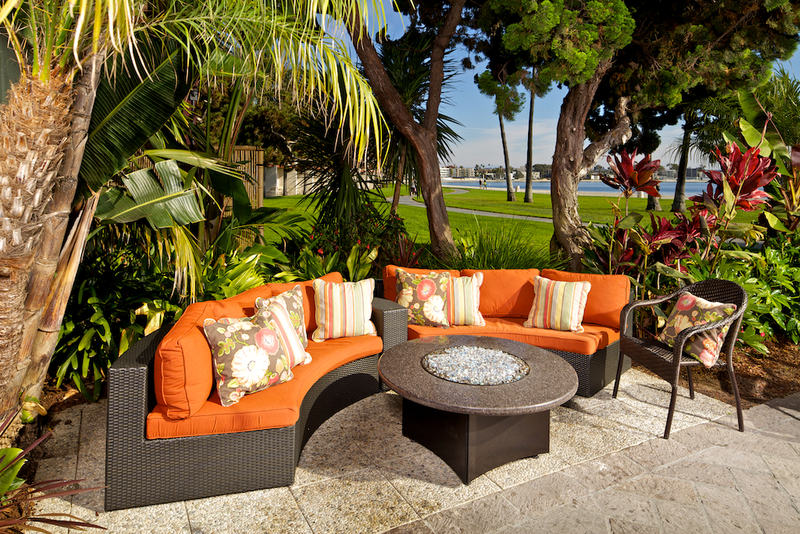 feet of space, of which 1700 is outdoor dining with views of the Pacific Ocean. 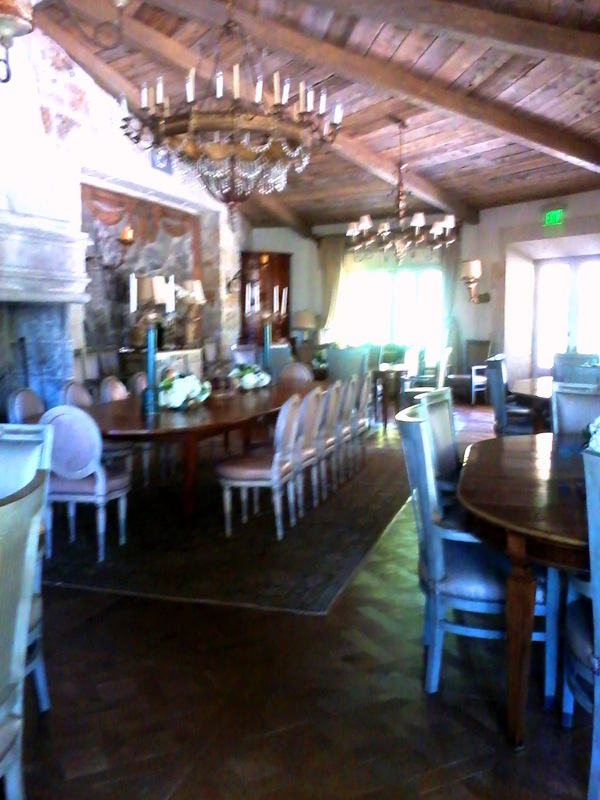 The setting is elegant yet casual. They use local organic produce as much as possible. I love the resorts dedication to green initiatives such as the Blink recharging system for electrical cars, use of recycled paper products, organically grown flowers, green transportation, sustainable food options, china service for meetings to avoid all the waste that often accompanies these events. They even donate left over food. These are photos from their website. The rooms range from 488 sq. ft to 915 ft. for the Presidential suite. Prices start at $199 per night and go up to $639, plus a $12 fee for internet, paper, resort activities, and use of fitness center. There are 250 rooms. They are pet friendly. I highly recommend these facilities for locals as well as guests either visiting Lego Land, or wanting a mid-range lovely resort option for their ocean vacation. The airport is close by and soon there will be major airline service there, in addition to the computer jets. 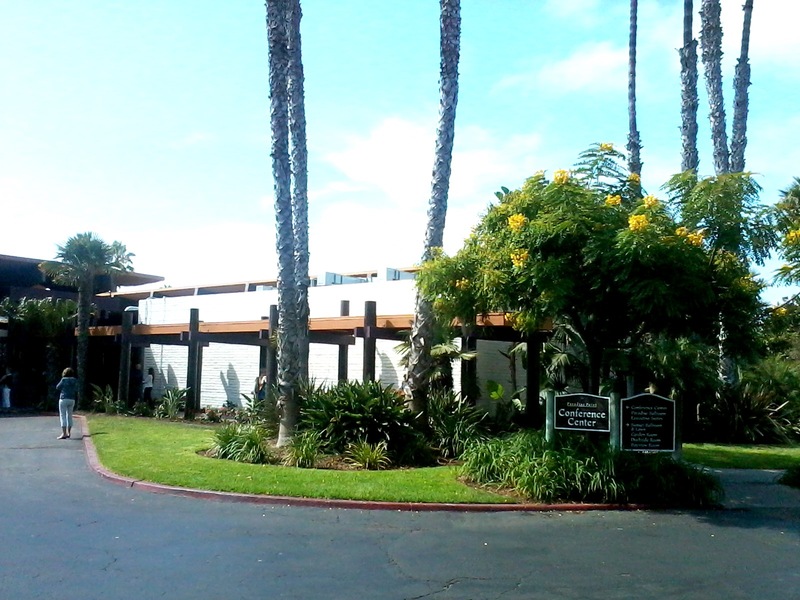 It is very close to the ocean near the I-5 interstate and there is transportation offered to the beach and other local attractions! 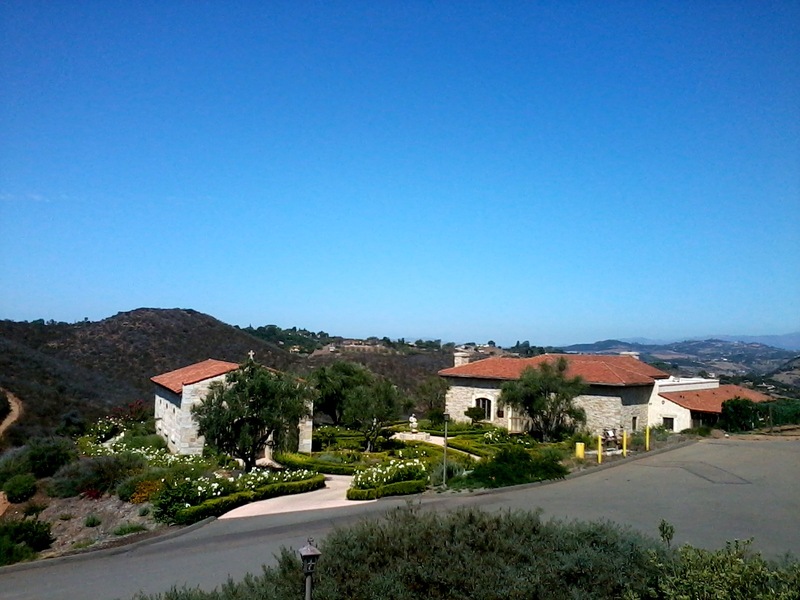 I have researched Wellness centers and resorts for 34 years, interviewing people who started wellness/retreat centers, people who managed them, land developers, organizational developers, construction supervisors, real estate agents who specialize in selling large properties for this use, spa managers, venture capitalists,etc. Along with this, I have researched online over 70 resorts, spas and wellness centers/learning centers world wide. I have done this research to not only prepare to one day create my own, but to also act as a consultant to people wanting to create wellness centers and refer my clients to resorts that fit their budget and desired experiences. 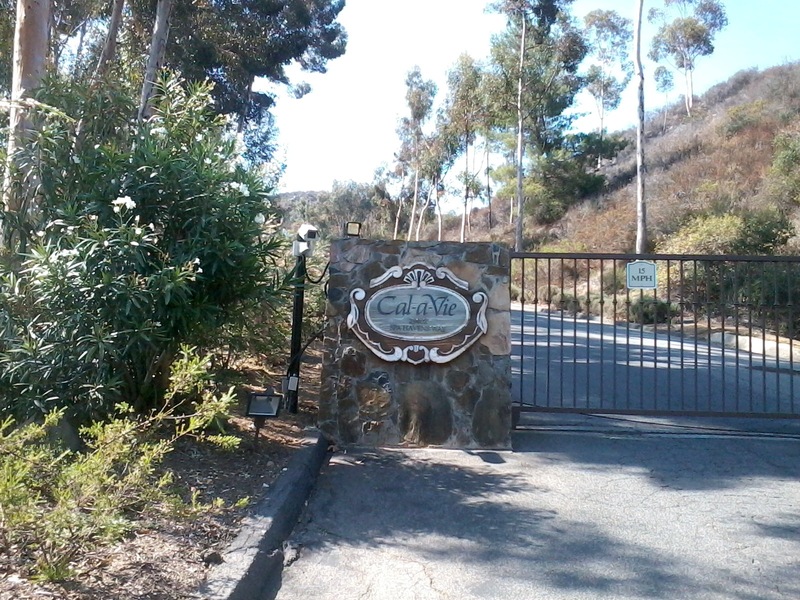 The Ojai Valley Inn and Spa was one of the ones I researched and has long been one of my favorites due to their beautiful Spanish architecture and use of tiles. In July I finally got to visit in person and thanks to Ashleigh Tripp, a warm, generous and enthusiastic guide, who works in the marketing dept., I received a wonderful tour of the resort. I had walked around a little before hand and took some photos but Ashleigh really filled in the picture for me and was very patient with all my questions. 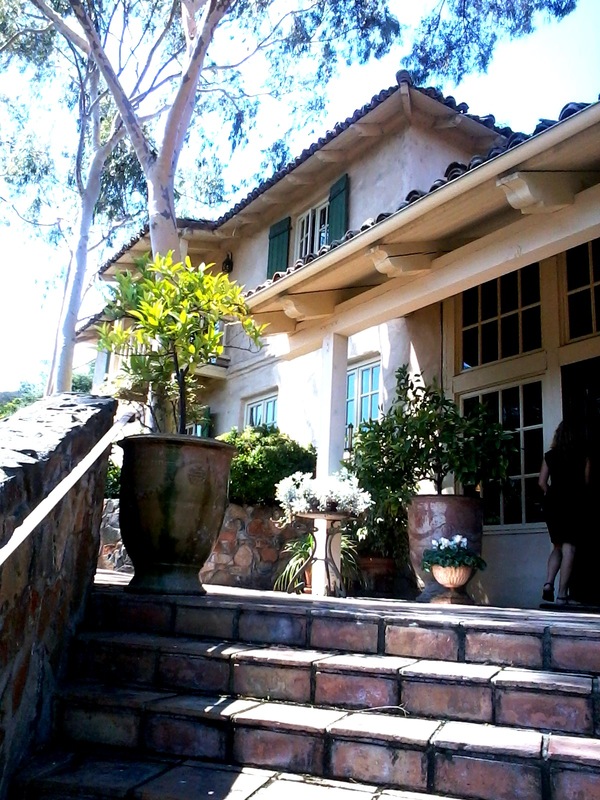 I loved learning the history of the place…that it was first conceived in 1923 and built as a country club and golf course but the first rooms for the Inn weren’t built until 1934. I love that those rooms have still been kept intact. In 1942 the land was used by 1000 army troops for a training ground and they took over the golf course land, pretty much leaving it unusable as a golf course. The Navy also used the property after that for a recuperation facility. 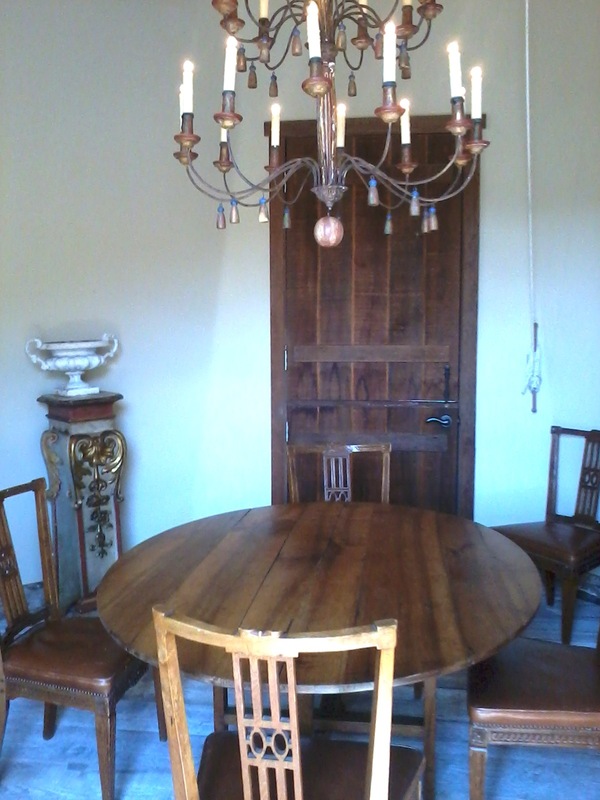 In 1947 a new owner reopened it after restoring it. 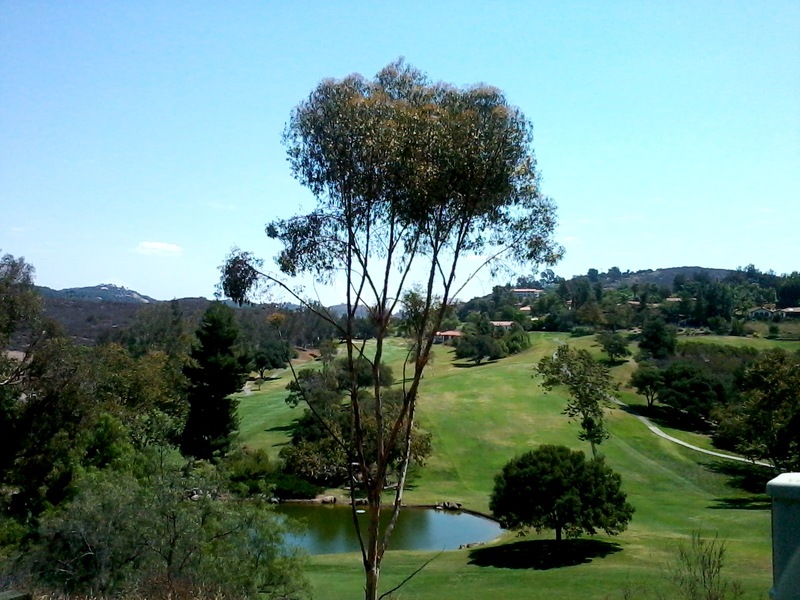 The golf course had originally been created leaving large trees and other natural areas left intact and that was kept in mind in restoring it. Through different owners and over the years, all the renovations have kept true to the history and the original architecture. 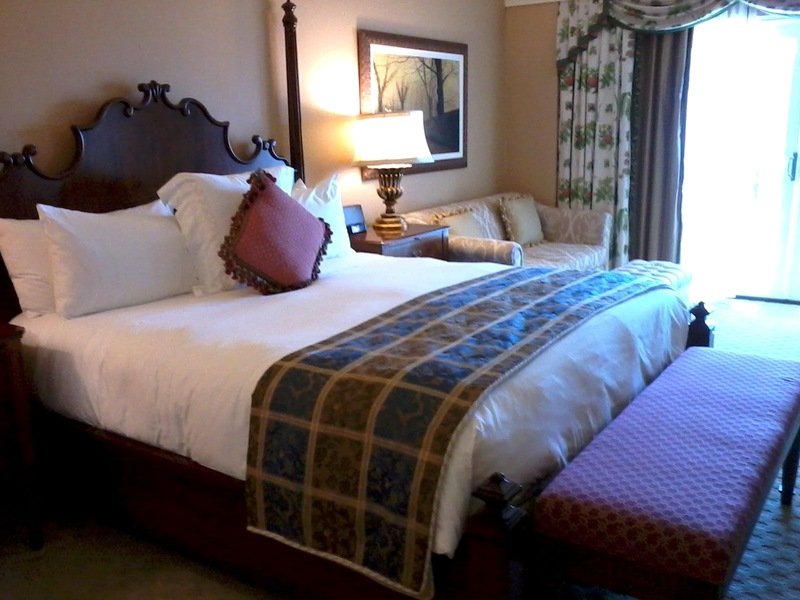 The resort now has 308 rooms and suites ranging in size from 425 sq. ft to 1200 sq. 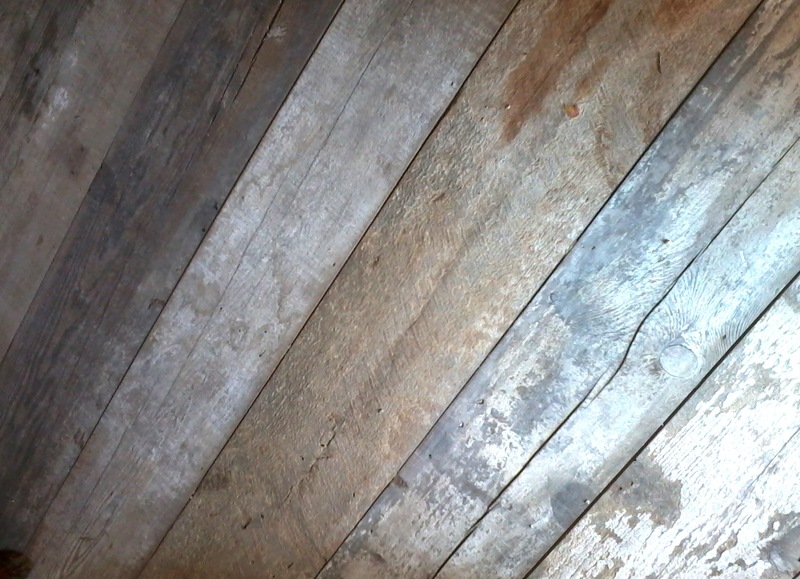 feet and 1200 – 1900 sq feet for the penthouses. 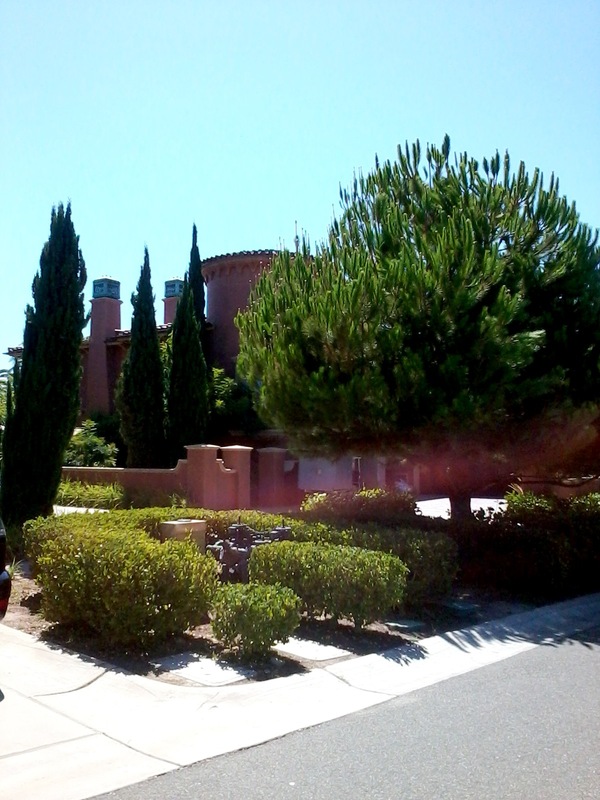 Along with the rooms there is also a gorgeous villa, called Casa Elar which is 10, 407 sq. 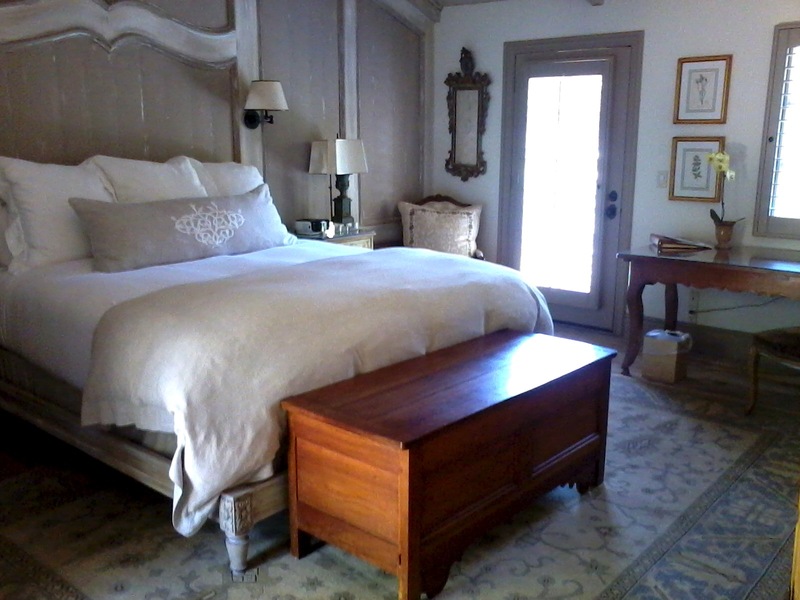 ft, has two two-room master bedroom suites, it’s own massage room, 2 bedrooms downstairs, staff quarters, its own pool and spa. Room rates start at $389. 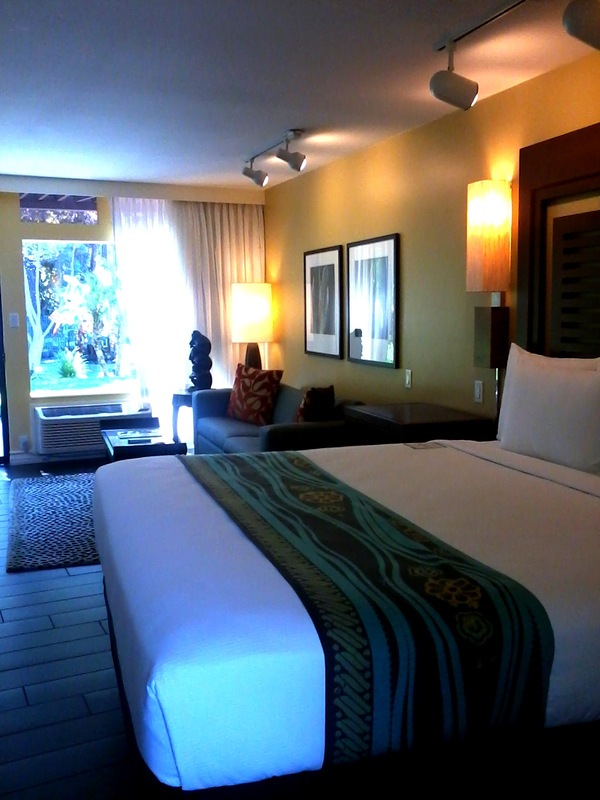 There are packages available and the resort regularly offers coupon and other offers to locals. 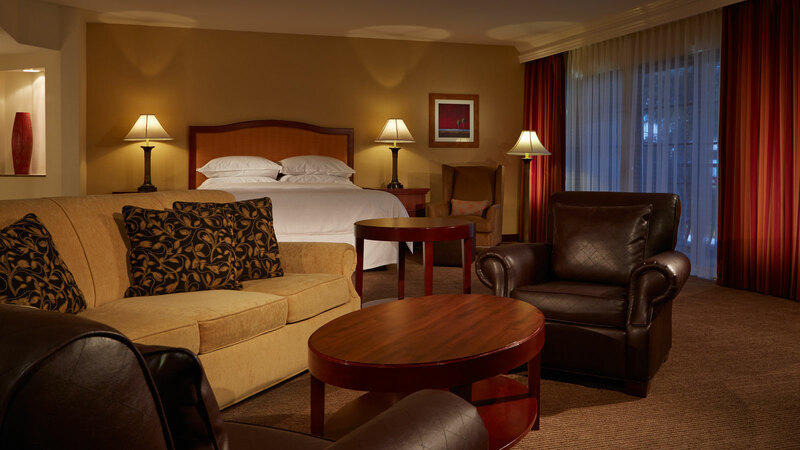 The room rate has an added $25 service charge which includes use of the golf practice facilities, tennis courts , fitness classes, Nest teen center, and activity center along with a few other amenities. 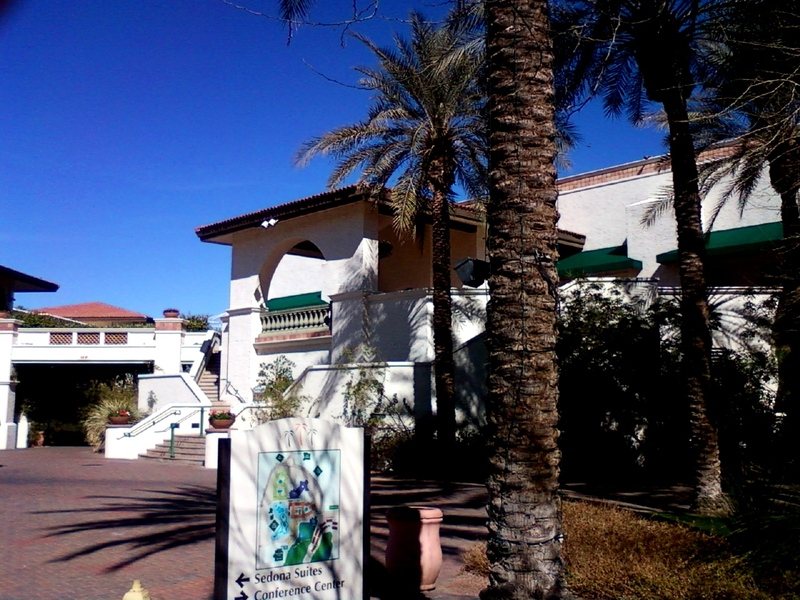 The resort is pet friendly and even offers dog training classes. Everyone I encountered was very warm and friendly, and it was obvious that the resort truly welcomes its guests, both local and from other locales. 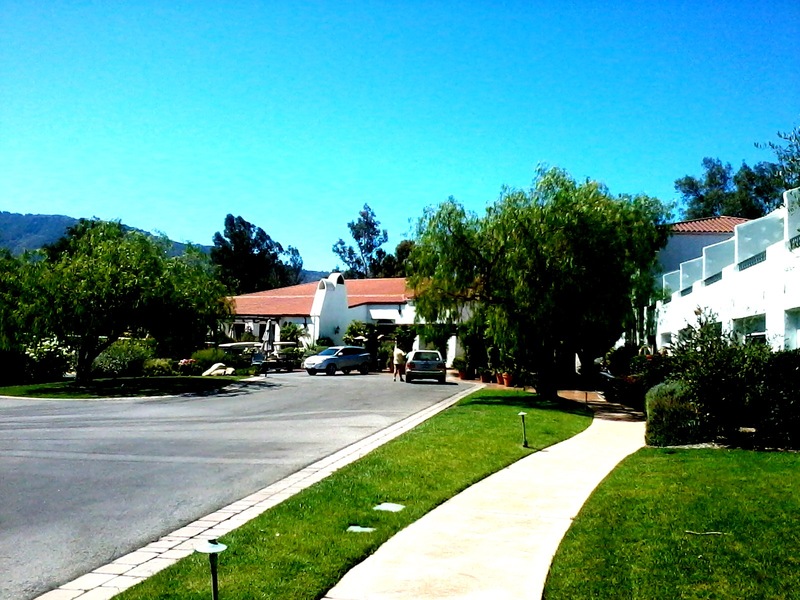 The resort even has some onsite housing for employees. Sustainability is a strong focus and the onsite apothecary makes all the bath products available in the rooms, and recycles any of them left over. Recycling containers are sprinkled around the area and strongly encouraged. 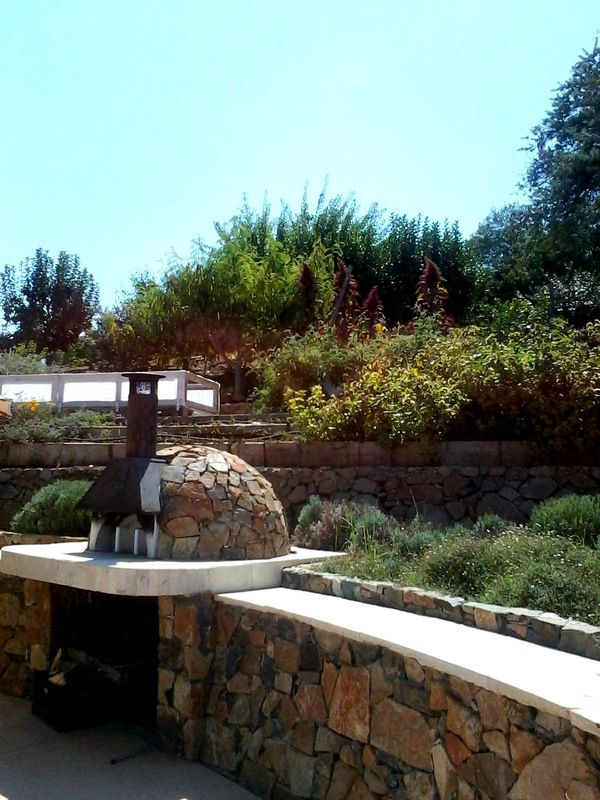 As much as possible they serve local and organic produce, even growing herbs in their gardens onsite and heirloom tomatoes. 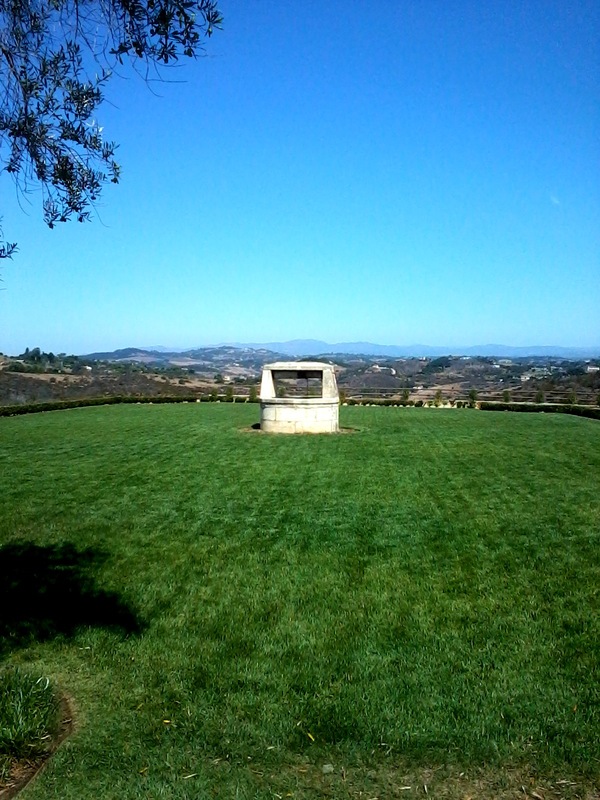 They turned an old horse ranch and barn into an organic farm and split the crops with the growers and use the rest in their restaurants. The barn was turned into a wedding venue. They use only certified fish on their menus as well. 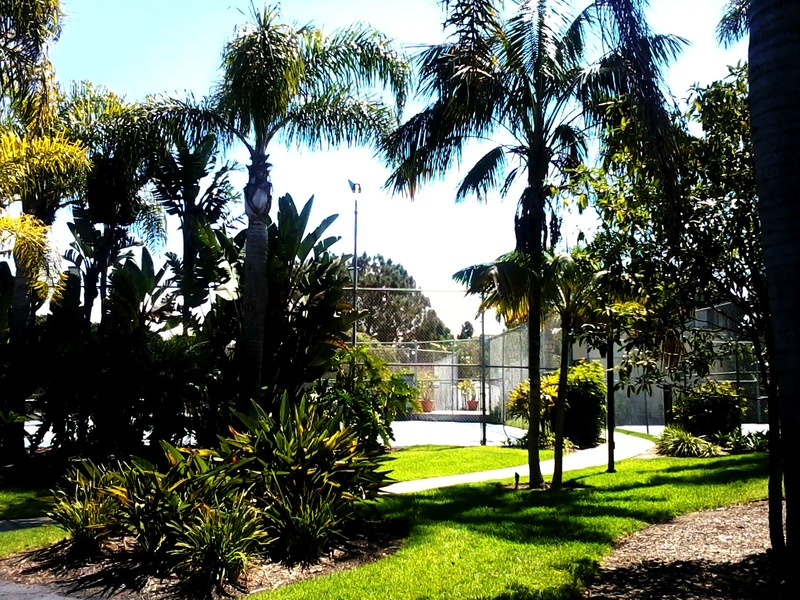 Facilities include tennis courts and instruction, an 18 hole championship golf course and other golf training facilities, 4 pools, ping pong, a basketball court, a game room located at the adult only Herb Garden pool, activities and camps for the kids. The golf course offers golf academies spread throughout the year, catering to different skill levels. 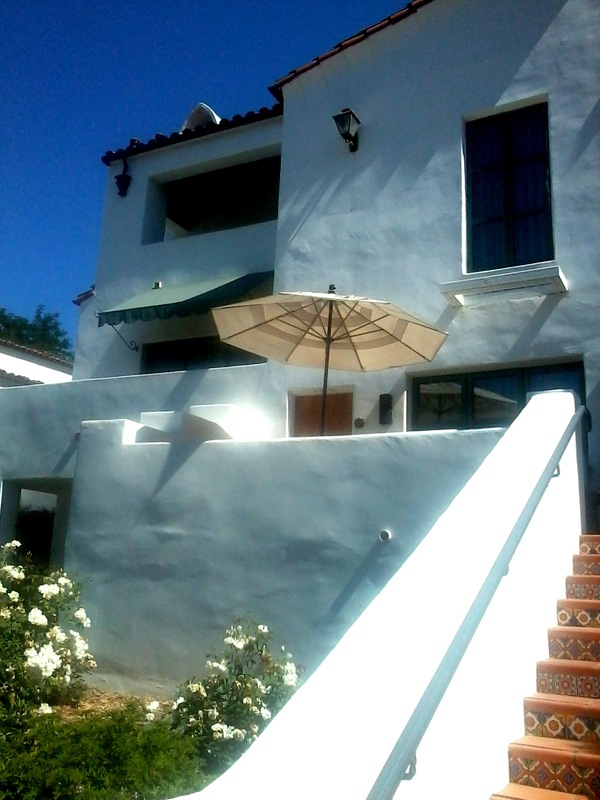 In the building that houses the apothecary and artist cottage, guests can paint glasses, tiles, silk scarves or use mixed media, in addition to personal assistance in creating a hand picked aromatherapy oil to be used in their body treatments or massages. 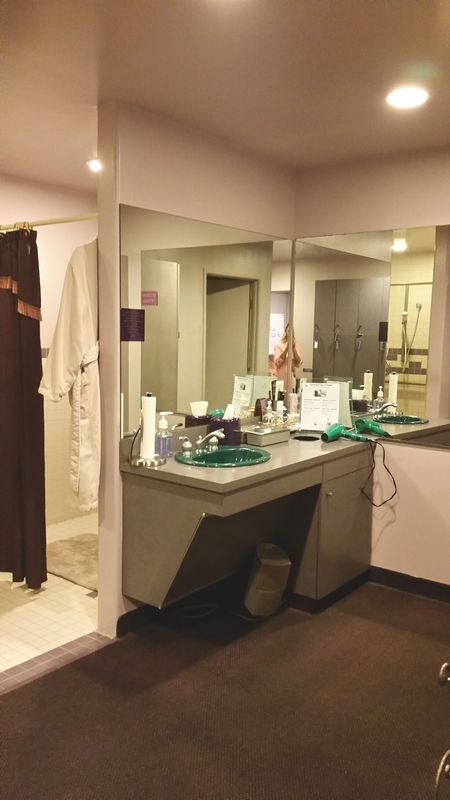 The spa offers the usual massages, facials, salon offerings, along with several spiritual therapies and a unique Native American flavored sweat and clay ceremony/treatment that honors the history of the local tribes. 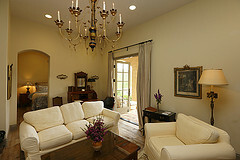 Guests can choose a room near the spa or golf course if that is their focus for their stay. 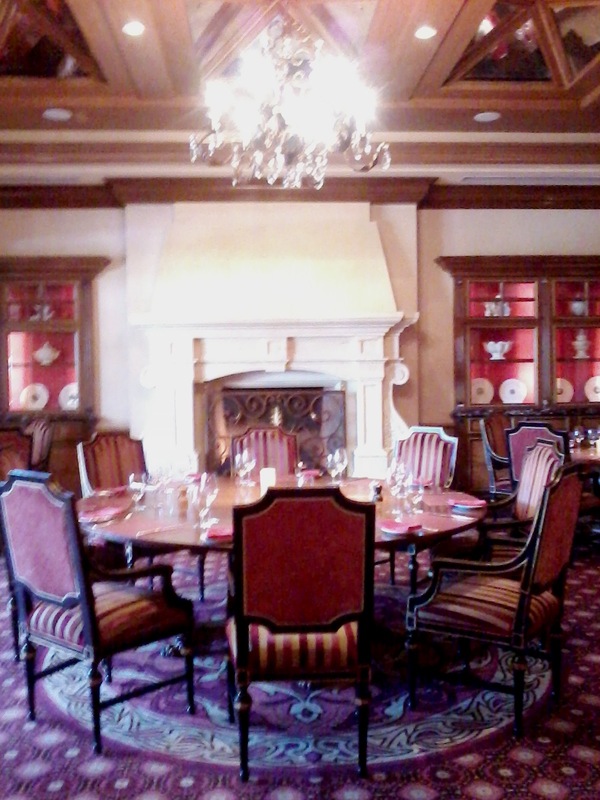 There are six restaurants scattered around the resort and in-room dining. 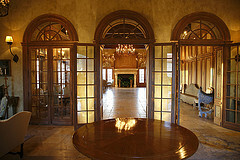 With all of its array of facilities and activities, this is a great place for business events, reunions and weddings. 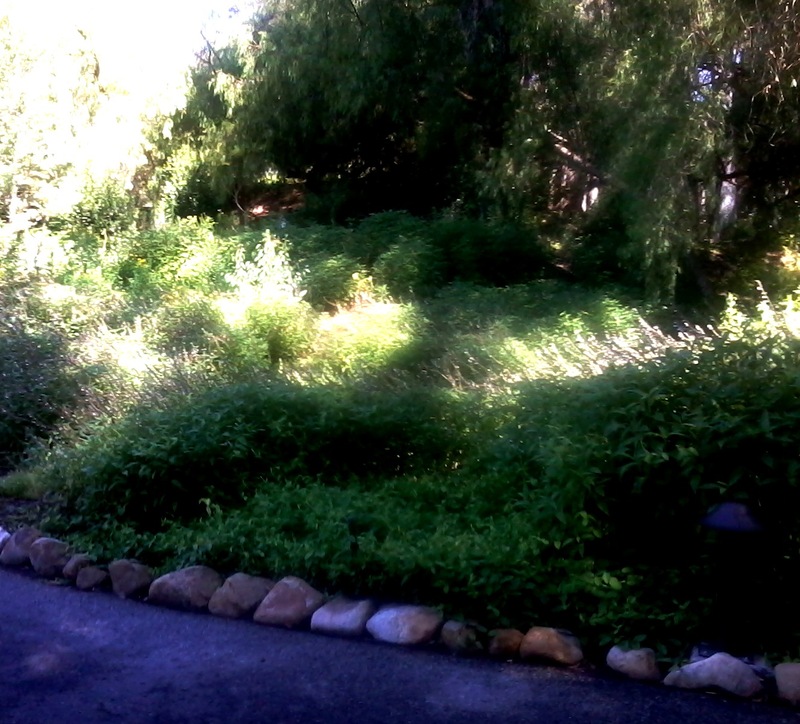 There is a large expansive event lawn near the herb gardens and heirloom tomatoes. 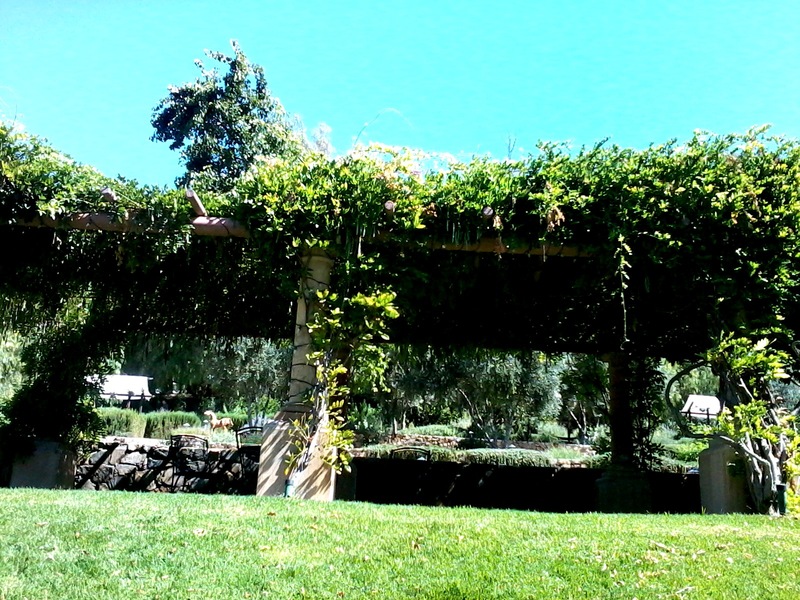 There is an arbor with seating under it for a cocktail or quiet place to gather. 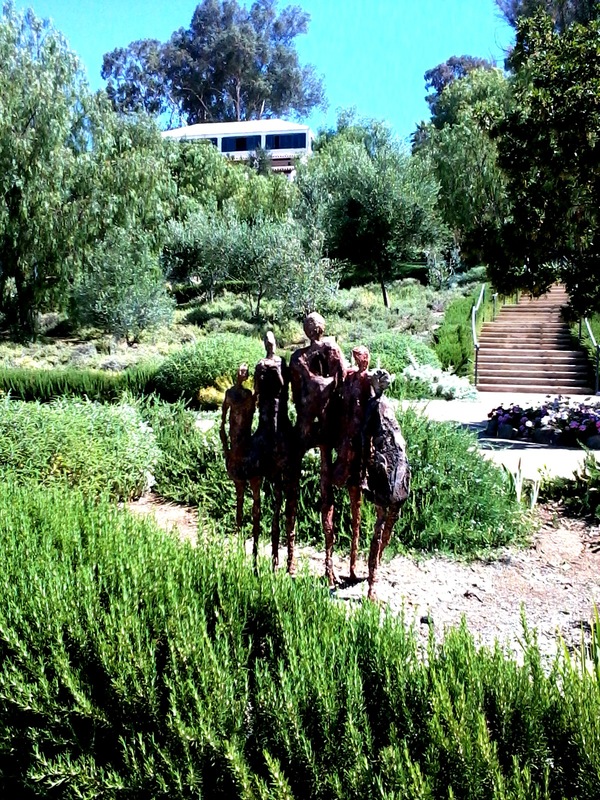 I enjoyed all the spirited sculptures placed around the grounds and the beautiful landscaping. The resort even hosts resident parrots that have their own trainer to care for them and educate the guests! 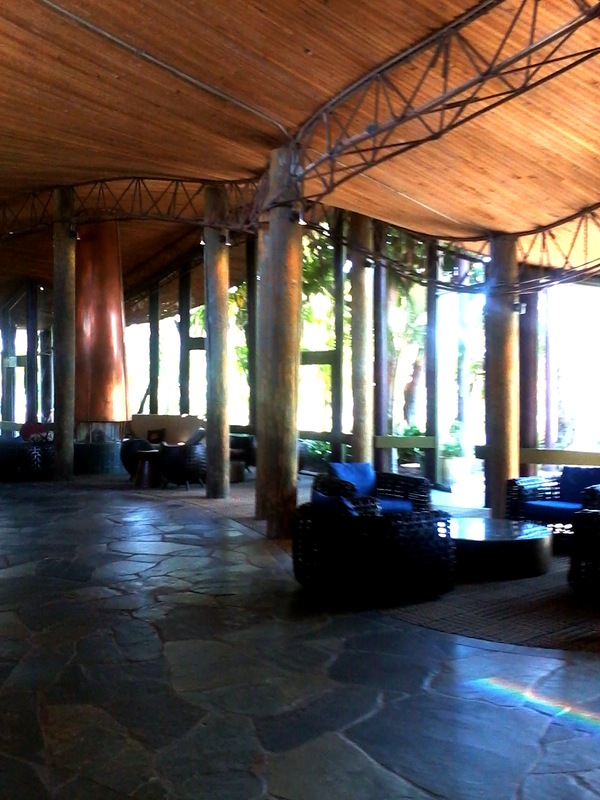 I was very impressed with this resort and it’s attention to sustainability, comfort, variety and beauty! Come check it out. 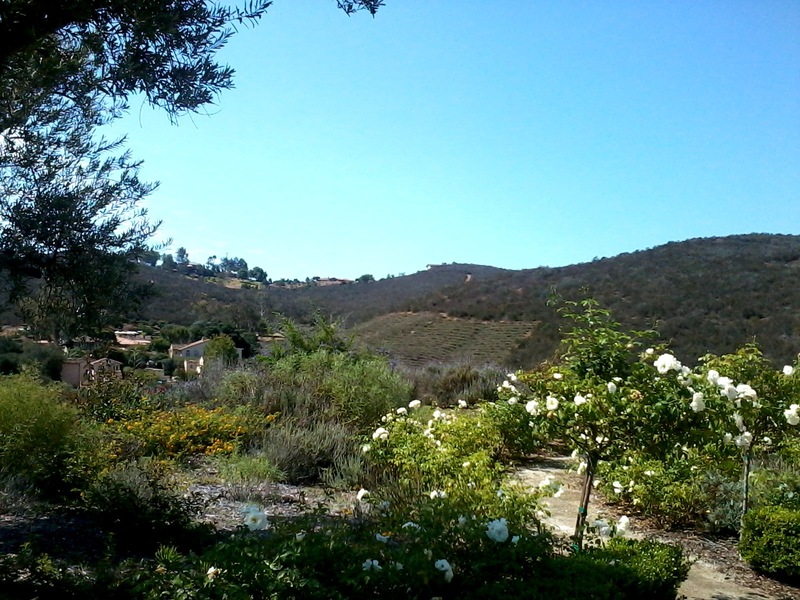 It is close to LA, close the beach, close to mountains!